에틸렌계 불포화 무수물과 비닐 화합물과의 공중합체인 카복실산 무수물(a), 에틸렌계 불포화 무수물과 탄성중합체와의 공중합체(b) 및 임의로 성분(a)와 (b)의 상 분리를 막기 위한 블록 공중합체와 같은 안정제(c)의 배합물을 함유하는, 에폭시 수지를 경화하는 데 유용한 경화제 조성물이다. Copolymerization of the ethylenically unsaturated anhydride and a vinyl compound chain carboxylic acid anhydride (a), ethylenically unsaturated anhydride with the elastomeric copolymer (b) and optionally component (a) and the block copolymer to prevent phase separation of the (b) and containing a combination of a stabilizer (c), such as, curing agent compositions are useful to cure the epoxy resin. 경화제 조성물은 전기 적층물 응용 분야에서 특히 유용하다. Curing agent compositions are particularly useful in electrical laminate applications. 에폭시 수지, 경화제, 섬유 보강재, 프리프레그, 적층물. Epoxy resin, curing agent, reinforcing fibers, a prepreg, a laminate. 본 발명은 에폭시 수지를 경화하기 위한 가교결합제로서 유용한 조성물에 관한 것이다. The present invention relates to a composition useful as a crosslinker for curing epoxy resins. 더욱 구체적으로, 본 발명은 에폭시 수지를 경화하기 위한 가교결합제로서 유용한 경화제 조성물에 관한 것이다. More particularly, the present invention relates to a hardener composition useful as a crosslinker for curing epoxy resins. 에폭시 수지는 예컨대 전기 적층물 응용에서 유용하다. Epoxy resins are, for example, are useful in electrical laminate applications. (1) 에폭시-함유 조성물을 롤링, 침적, 분무, 기타 공지의 기술 및/또는 이들의 조합에 의해 기재에 도포 또는 함침시킨다. (1) Epoxy-then coated or impregnated in a base material by a composition containing a rolling, dipping, spraying, other known techniques and / or combinations thereof. 기재는 전형적으로, 예를 들면, 유리 섬유 또는 종이를 함유하는 직포 또는 부직포 섬유 매트이다. The substrate is typically, for example, a woven or nonwoven fiber mat containing glass fibers or paper. (2) 함침된 기재를 용이하게 취급할 수 있도록, 함침된 기재를 에폭시-함유 조성물 중의 용매를 방출시키고 임의로 에폭시-함유 조성물을 부분적으로 경화시키기에 충분한 온도로 가열하는 "B-스테이지(B-stage) 처리"를 수행한다. (2) to facilitate handling the impregnated base material, a base material impregnated with an epoxy-containing composition and optionally release the solvent in the epoxy-heated to a temperature sufficient to partially cure the composition containing "B- stage (B- performs stage) process ". "B-스테이지 처리" 단계는 일반적으로 90℃ 내지 210℃의 온도에서 1분 내지 15분 동안 수행한다. "B- staging" step is usually carried out for 1 to 15 minutes at a temperature of 90 ℃ to 210 ℃. B-스테이지 처리에서 얻어지는 함침된 기재를 "프리프레그(prepreg)"라고 부른다. The impregnated substrate obtained from B- staging is called a "prepreg (prepreg)". 온도는 가장 통상적으로, 복합재에 대해서는 100℃, 전기 적층물에 대해서는 130℃ 내지 200℃이다. Temperatures are most typically, 100 ℃ for the composite material, 130 ℃ to 200 ℃ for electrical laminates. (3) 전기 적층물을 제조하고자 하는 경우, 1장 이상의 프리프레그 시트를 1장 이상의 도전성 재료의 시트(예: 구리 호일)와 함께 번갈아서 층층이 쌓거나 겹쳐 올린다. (3) When electrical laminate to be prepared with water, a sheet of electrically conductive material at least one of the prepreg sheet 1 or more (e.g., copper foil) with the alternately stacked up layered or overlapping. (4) 겹쳐 올린 시트들을 고온 및 고압에서 수지를 경화하고 적층물을 성형하기에 충분한 시간 동안 압축시킨다. (4) to cure the resin at high temperature and high pressure a raised superimposed seat and compression for a time sufficient to form the laminate. 이 적층 단계의 온도는 일반적으로 100℃ 내지 230℃, 특히 165℃ 내지 200℃이다. The temperature of the laminating step is generally from 100 ℃ to 230 ℃, especially 165 ℃ to 200 ℃. 적층 단계는 둘 이상의 단계, 즉 100℃ 내지 150℃의 제1 단계와 165℃ 내지 190℃의 제2 단계로 수행할 수도 있다. Lamination step may also be carried out in two or more steps, that is, 100 ℃ to the first stage of 150 ℃ and a second stage of 165 ℃ to 190 ℃. 압력은 일반적으로 50N/㎠ 내지 500N/㎠이다. Pressure is generally 50N / ㎠ to 500N / ㎠. 적층 단계는 일반적으로 1분 내지 200분, 특히 45분 내지 90분 동안 수행한다. Lamination step is usually carried out for one minute to 200 minutes, especially 45 minutes to 90 minutes. 적층 단계는 임의로 (연속식 적층 공정과 같이) 더 높은 온도에서 더 짧은 시간 동안 수행하거나, (저에너지 압축 공정과 같이) 더 낮은 온도에서 더 긴 시간 동안 수행할 수 있다. Lamination step may optionally be performed during (as a continuous lamination processes) further performed for a shorter time at a higher temperature, or more longer time at a lower temperature (as low-energy compression step). 임의로, 생성된 적층물(예: 구리 호일 적층물)을 고온 및 주위 압력에서 일정 시간 동안 가열함으로써 후-처리할 수 있다. Optionally, the resulting laminate after heated for a predetermined time (for example, copper foil laminate) at a high temperature and ambient pressure - can be processed. 후-처리의 온도는 일반적으로 120℃ 내지 250℃이다. After-treatment temperature is generally from 120 ℃ to 250 ℃. 후-처리 시간은 일반적으로 30분 내지 12시간이다. After-treatment time is generally 30 minutes to 12 hours. 에폭시-함유 적층물의 제조에 있어서, 에폭시 조성물을 가교결합하여 열경화성 수지를 형성하기 위하여 에폭시 수지 조성물 중에 경화제("가교결합제"라고도 부른다)를 혼입시키는 것이 통상적이다. Epoxy-in the production of water-containing laminate, it is common to combine the cross-linked epoxy compositions incorporating a curing agent (also referred to as "crosslinking agent") in the epoxy resin composition to form a thermoset resin. 아민, 페놀류, 무수물, 카복실산, 머캅탄 및 이소시아네이트를 포함한, 에폭시 수지를 위한 각종 경화제가 일반적으로 공지되어 있다. Including amines, phenolics, anhydrides, carboxylic acids, mercaptans and isocyanates, there are various curing agents for epoxy resins are generally known. 에폭시 수지는 친핵성 성분과 친전자성 성분 모두와의 반응에 의해 단독중합도 가능하다. Epoxy resin is solely possible degree of polymerization by reaction with a both a nucleophilic component with an electrophilic component. 전기 적층물 산업의 최근 경향은, 낮은 유전 상수(Dk) 및 유전정접(Df)을 포함한 개선된 유전 특성; A recent trend of the electrical laminates industry, improved dielectric properties including lower dielectric constant (Dk) and dissipation factor (Df); 높은 유리 전이 온도(Tg) 및 분해 온도(Td)를 포함한 우수한 열적 특성; Superior thermal properties including high glass transition temperature (Tg) and decomposition temperature (Td); 및 양호한 가공성을 갖는 소재를 필요로 한다. And it requires a material that has good processability. 적층물 특성을 개선하기 위한 한 가지 공지 방법은 내연성 에폭시 수지를 스티렌-말레산 무수물 공중합체(SMA)와 같은 무수물 경화제로 경화시키는 단계로 이루어진다. One kinds of known methods for improving laminate properties is a flame-resistant epoxy resin, a styrene-a step of curing with a curing agent such as anhydride and maleic anhydride copolymer (SMA). 예를 들어, 에폭시 수지용 가교결합제로서 SMA의 사용은 미국 특허 출원 공개 제2002/0082350 A1호에 개시되어 있다. For example, the use of SMA as cross-linking agents for epoxy resins is disclosed in U.S. Patent Application Publication No. 2002/0082350 A1. 이러한 공지된 SMA 경화제 시스템의 주된 단점은 높은 취성을 갖는 적층물을 제공한다는 것이다. The main disadvantage of this known SMA hardener system is that it provides laminates with high brittleness. 또한, 공지된 SMA 경화제 시스템은 가공성이 불량한데, 그 이유는 공지된 SMA 경화제로 만들어진 프리프레그 분말은 유리 웹과 같은 기재로부터 이탈되기 쉬워서 프리프레그의 취급시 다량의 분진이 발생하기 때문이다[이른바 "머쉬룸(mushroom)" 효과]. In addition, the known SMA hardener system together workability is poor, because a prepreg powder made with the known SMA hardener is because a large amount of dust generated during liable to be released from the substrate such as a glass web prepreg handling [so-called "mushroom (mushroom)" effect. 더욱이, 공지된 SMA 경화제로부터 제조된 적층물은 강인성이 낮고 박리되기 쉬워서 적층물을 드릴링하는 동안 결함이 발생한다. Furthermore, prepared from the known SMA hardener laminate it is caused a defect while drilling the stack liable to be peeled off with low toughness. 종종 수득된 프리프레그는 포획된 기포로 인해 외관이 좋지 못한 경우도 있다. Often resulting prepreg is also due to the trapped air bubbles If you have a good appearance. 따라서, 종래 기술의 단점을 갖지 않는 에폭시 수지용 경화제 시스템이 요구되고 있다. Accordingly, the epoxy resin curing agent system is desired which does not have the disadvantages of the prior art. 본 발명의 한 측면은 에폭시 수지, 예를 들면, 전기 적층물의 제조에 사용되는 에폭시 수지용 경화제 조성물에 관한 것이다. One aspect of the present invention is an epoxy resin, for example, to a curing agent composition for epoxy resins used in the manufacture of electrical laminate. 경화제 조성물은, 에틸렌계 불포화 무수물과 비닐 화합물과의 공중합체인 카복실산 무수물(a), 예를 들면, 스티렌-말레산 무수물(SMA) 공중합체; The curing agent composition, the ethylene-based copolymer of acid anhydride (a), for example, styrene with an unsaturated anhydride and a vinyl compound-maleic anhydride (SMA) copolymer; 에틸렌계 불포화 무수물과 탄성중합체와의 공중합체(b), 예를 들면, 말레산 무수물-개질된 폴리부타디엔(PBMA); Copolymer (b) with the ethylenically unsaturated anhydride and an elastomer, for example, maleic anhydride-modified polybutadiene (PBMA); 및 임의로 SMA와 PBMA의 상 분리를 막기 위한 안정제(c), 예를 들면, 스티렌-부타디엔-메틸 메타크릴레이트 트리블록 중합체(SBM)의 배합물을 포함한다. And optionally a stabilizing agent to prevent phase separation of the SMA and PBMA (c), for example, styrene-comprises a blend of methyl methacrylate triblock polymer (SBM) - butadiene. 성분(a), (b) 및 존재하는 경우 (c)는 경화제 및 경화제가 사용되는 에폭시 수지의 바람직한 특성을 유지하기에 바람직한 비율로 배합물 중에 존재한다. Components (a), if (b) and presence (c) is present in the formulation in a preferred ratio to maintain the desired properties of the epoxy resin curing agent and a curing agent that is used. 본 발명의 다른 측면은 상술한 경화제 조성물을 함유하는 경화성 에폭시 수지 조성물에 관한 것이다. Another aspect of the invention relates to a curable epoxy resin composition containing the above-described curing agent compositions. 본 발명의 또 다른 측면은 상기 경화성 에폭시 수지 조성물로부터 제조된 프리프레그 또는 적층물에 관한 것이다. Another aspect of the invention relates to a prepreg or a laminate made from the curable epoxy resin composition. 본 발명의 경화제 조성물을 에폭시 수지/경화제 시스템에 사용하는 경우 몇 가지 이점이 얻어지는데, 그 예로는 (ⅰ) 에폭시 수지 조성물은 수지 조성물 중의 에폭시 성분 및 부가 성분들 사이의 상 분리가 일어나지 않고, (ⅱ) 성분(a), (b) 및 (c)가 적합한 비율로 사용된 경우, 사용된 용매에 따라서 투명한 용액 또는 안정한 분산액인 에폭시/경화제 와니스가 얻어지며, (ⅲ) 부분적으로 경화된 B-스테이지 처리의 프리프레그는 표준 SMA 에폭시 시스템에 비해서, 예를 들면, 개선된 표면 외관을 갖고 취급 중 분진 발생이 적으며, (ⅳ) 완전히 경화된 C-단계의 적층물은 표준 SMA/에폭시계에 비해 또는 표준 강인화제를 갖는 에폭시 수지 시스템에 비해 개선된 강인성을 갖고 박리 경향이 적은 등의 개선된 적층물 특성을 나타내고, (ⅴ) 개선된 유전 특성을 갖는 Are several advantages to using the curing agent composition of the present invention, the epoxy resin / curing agent system is obtained, and examples thereof include (ⅰ) an epoxy resin composition without phase separation between the epoxy component and the additional component in the resin composition not occur, ( the ⅱ) components (a), (b) and (c) is obtained is, a clear solution or a stable dispersion depending on the solvent used is an epoxy / hardener varnish when used in suitable proportions, (ⅲ) partially curing B- the prepreg of the stage process compared to standard SMA epoxy systems, for example, were to have an improved surface appearance is less dust during handling, (ⅳ) laminate of step C- fully cured is a standard SMA / epoxy or robust than standard have an improved toughness compared to epoxy resin systems having the subject indicates an improved laminate properties, such as peeling tends to lower, (ⅴ) having improved dielectric properties 층물, 및 (ⅵ) 높은 유리 전이 온도 및 높은 내열성과 같은 향상된 열적 특성을 갖는 적층물이 얻어진다. Cheungmul, and (ⅵ) a laminate is obtained having improved thermal properties, such as high glass transition temperature and high heat resistance. 일반적으로, 본 발명의 경화제 시스템은 에폭시 수지를 위한 효과적인 경화제 조성물을 제공하기에 적합한 양으로 에틸렌계 불포화 무수물과 비닐 화합물과의 공중합체인 카복실산 무수물(a), 에틸렌계 불포화 무수물과 탄성중합체와의 공중합체(b), 및 임의로 안정제(c)를 함유하는 배합물을 포함한다. In general, the air of the curing agent system of the present invention in an amount suitable to provide an effective hardener composition for the epoxy resin, ethylene-based copolymer of a carboxylic anhydride of the unsaturated anhydride and a vinyl compound (a), an ethylenically unsaturated anhydride and an elastomer It comprises a copolymer (b), and optionally a formulation containing a stabilizer (c). 본 발명의 경화제 조성물은 (i) 에틸렌계 불포화 무수물, 및 (ⅱ) 비닐 화합물의 공중합체로 정의되는 성분(a)를 함유한다. The curing agent composition of the present invention contains components (a), defined as (i) an ethylenically unsaturated anhydride, and (ⅱ) copolymers of vinyl compounds. 에틸렌계 불포화 무수물과 비닐 화합물과의 공중합체는, 예를 들면, 스티렌-말레산 무수물 공중합체(SMA) 및 예컨대 국제 공개공보 WO 제95/06075호에 개시된 기타의 공중합체들을 포함한다. A copolymer of an ethylenically unsaturated anhydride and a vinyl compound, for example, styrene-maleic anhydride copolymer comprises (SMA) and other example of the copolymer disclosed in International Publication No. WO 95/06075 the call. 분자량(Mw)이 1,500 내지 50,000 범위이고 무수물 함량이 15%를 초과하는 스티렌과 말레산 무수물과의 공중합체가 특히 바람직하다. The molecular weight (Mw) of the copolymer is 1,500 to 50,000, and styrene and maleic anhydride, the anhydride content of more than 15% is particularly preferred. 이러한 공중합체 재료의 시판 예로는 스티렌-말레산 무수물 비가 각각 1:1, 2:1, 3:1 및 4:1이고 분자량 범위가 6,000 내지 15,000인 아토피나(Atofina)사로부터 상업적으로 구입가능한 SMA 1000, SMA 2000, SMA 3000 및 SMA 4000이 포함된다. These commercially available example of the copolymer material is a styrene-maleic anhydride ratio of each of 1: 1, 2: 1, 3: 1 and 4: the 1 and commercially available from the Atofina (Atofina) a molecular weight of from 6,000 to 15,000 captive SMA 1000, SMA 2000, SMA 3000 and include SMA 4000. 본 발명의 경화제 조성물은 에틸렌계 불포화 무수물과 탄성중합체와의 공중합체, 예를 들면, 말레인화된 폴리부타디엔(PBMA)인 성분(b)를 또한 함유한다. The curing agent compositions of the present invention also contain a component (b) copolymers of an ethylenically unsaturated anhydride and an elastomer, for example, maleic personalized polybutadiene (PBMA). 본 발명에 사용되는 PBMA는 사르토머(Sartomer)사로부터 상업적으로 구입가능한 리콘(Ricon) R MA 수지와 같은 시판의 PBMA 제품일 수 있다. PBMA used in the present invention may be a commercially available PBMA product such as Sartomer (Sartomer) commercially available silicon (Ricon) R MA resin from the captured. 본 발명에 사용되는 말레인화된 폴리부타디엔은 미국 특허 제4,028,437호, 제4,601,944호 및 제5,300,569호에 설명된 바와 같이, 예를 들면, 폴리부타디엔을 말레산 무수물과 반응시키는 등의 각종 공지 기술에 따라 제조할 수도 있다. The maleinized used in the present invention, polybutadiene U.S. Patent No. 4,028,437, 1 - 4,601,944) and (as described in the 5,300,569 call, for example, in accordance with various known techniques, such that the maleic anhydride and the reaction of polybutadiene It can also be produced. 경화제 조성물에 사용되는 SMA 및 PBMA의 양은 SMA 대 PBMA의 중량비가 99:1 내지 70:30, 바람직하게는 95:5 내지 80:20으로 되도록 한다. The amount of the SMA and PBMA used in the curing agent composition wherein the weight ratio of SMA for PBMA 99: 1 to 70:30, preferably 95: so that from 5 to 80: 20. 본 발명의 임의의 안정제, 성분(c)는 여러 가지 중에서도 거대 상-분리를 막기 위하여 분산된 상과 혼화가능한 하나 이상의 블록 및 연속 상과 혼화가능한 하나 이상의 블록을 갖는 블록 공중합체를 포함한다. Any stabilizer, ingredient of the present invention (c) is among others the large-block comprises a copolymer having the miscible block and at least one continuous phase and at least one block miscible dispersible to prevent separation. 바람직한 안정제의 예는 트리블록 중합체, 스티렌-코-부타디엔-코-메틸 메타크릴레이트(SBM)이다. Examples of preferred stabilizers are triblock polymers, styrene-methyl methacrylate (SBM)-co-butadiene-co. 안정제가 존재하지 않으면 SMA/PBMA 시스템 상이 분리되기 때문에, 본 발명의 경화제 조성물에는 임의의 안정제를 첨가함이 바람직하다. If the stabilizer is not present since the SMA / PBMA system phase separation, the curing agent composition of the present invention, it is preferable to the addition of any stabilizer. 한편, 적합한 SMA/PBMA/SBM 비를 이루도록 하는 양으로 본 발명의 경화제 조성물 중에 SBM을 사용하는 경우에 본 발명의 경화제 시스템은 안정하고 탁한 분산액이다(상 분리 및 침전이 일어나지 않는다). On the other hand, the curing agent system of the present invention when using the SBM in the curing agent composition of the present invention in an amount to achieve the SMA / PBMA / SBM is a suitable non-stable turbid dispersion (the phase separation and precipitation does not occur). 본 발명의 경화제 조성물에 사용되는 안정제의 양은 PBMA 대 안정제의 비가 일반적으로 50:50 내지 99:1, 바람직하게는 60:40 내지 95:5, 더욱 바람직하게는 75:25 내지 85:15로 되도록 하는 양이다. Ratio is generally 50: 50 to 99 The amount of stabilizer used in the curing agent composition of the present invention for stabilizing PBMA: to 1, preferably 60: 40 to 95: to 5, more preferably from 75:25 to 85: 15 so as to an amount that. 경화제 조성물은 용매 또는 용매의 배합물에 용해될 수 있다. The curing agent composition can be dissolved in a solvent or combination of solvents. 적합한 용매의 예로는 여러 가지 중에서도 케톤, 에테르, 아세테이트, 방향족 탄화수소, 디메틸포름아미드 및 사이클로헥사논이 포함된다. Examples of suitable solvents are, among other include ketones, ethers, acetates, aromatic hydrocarbons, dimethylformamide, and cyclohexanone. 본 발명의 경화제 조성물은 상기 논의한 경화제 성분들 이외의 성분들을 함유할 수 있다. The curing agent composition of the present invention may contain components other than those discussed above curing agent component. 예를 들면, 경화제 조성물은 아민, 페놀류, 무수물, 카복실산, 머캅탄 및 이소시아네이트를 포함하는 에폭시 수지를 위한 기타의 공지된 경화제로부터 선택되는 보조-가교결합제인 기타의 상이한 가교결합제들을 함유할 수 있다. For example, the curing agent composition comprises amine, phenols, anhydrides, carboxylic acids, mercaptans and isocyanates auxiliary selected from other known curing agent for epoxy resins comprising - may contain different cross-linking agents of the other crosslinking agent. 미국 특허 제4,042,550호 및 제3,789,038호에 기재된 잘 알려진 보조-가교결합제를 본 발명에 사용할 수 있다. A well-known secondary described in U.S. Patent No. 3,789,038 and No. 4.04255 million - a cross linking agent can be used in the present invention. 일례로서, 본 발명에 사용할 수 있는 공지의 보조-가교결합제의 예로는 옥살산, 프탈산, 테레프탈산 및 석신산과 같은 카복실산; As an example, a known auxiliary which can be used in the present invention Examples of the crosslinking agent is selected from carboxylic acids, such as oxalic acid, phthalic acid, terephthalic acid and succinic; 프탈산 무수물, 석신산 무수물, 헥사하이드로프탈산 무수물, 테트라하이드로프탈산 무수물, 나딕 무수물(nadic anhydride) 및 말레산 무수물과 같은 무수물이 포함된다. Phthalic anhydride, include succinic anhydride, hexahydrophthalic acid anhydride, tetrahydrophthalic acid anhydride, anhydride, such as nadik anhydride (nadic anhydride) and maleic anhydride. 경화제 조성물에 존재하는 보조-가교결합제의 양은 SMA 대 보조-가교결합제의 중량비가 99:1 내지 50:50, 바람직하게는 95:5 내지 75:25로 되도록 하는 양일 수 있다. The amount of the crosslinking agent SMA for secondary-secondary curing agent present in the composition at a weight ratio of cross-linking agent of 99: 1 to 50:50, preferably 95: may be the amount such that 5 to 75: 25. 본 발명의 경화제 조성물은 20℃ 이상의 온도, 바람직하게는 20℃ 내지 150℃, 더욱 바람직하게는 60℃ 내지 100℃의 온도에서, 조성물의 모든 성분들을 임의의 순서로 바람직하게는 예컨대 용매에 용해시켜서 용액 형태로 함께 혼합하여 제조할 수 있다. The curing agent composition of the present invention is dissolved in a preferably, for example, a solvent at a temperature of at least 20 ℃, preferably from 20 ℃ to 150 ℃, more preferably at a temperature of 60 ℃ to 100 ℃, in any order, all the components of the composition together in solution form can be prepared by mixing. 경화제 용액을 저온, 예를 들면, 주위 온도(~25℃)에서 제조하는 경우 성분들을 용매에 용해시키는데 더 긴 시간이 소요된다. A low temperature curing agent solution, for example, it takes a longer time to dissolve in the solvent of the components when manufacturing at ambient temperature (~ 25 ℃). 상술한 경화제 조성물은 유리하게는 에폭시 수지와 함께 사용되어 경화성 에폭시 수지 조성물을 형성한다. The above-mentioned curing agent composition is advantageously used in conjunction with epoxy resin to form a curable epoxy resin composition. 본 발명의 경화제 조성물은 경화제와 에폭시 수지의 에폭시 잔기 사이에 가교결합을 제공하여 열경화성 수지를 형성한다. The curing agent composition of the present invention to provide crosslinking between the epoxy moieties of the curing agent with the epoxy resin to form a thermoset resin. 경화성 에폭시 수지 조성물에 사용되는 에폭시 수지 성분은 폴리에폭사이드이다. Epoxy resin component used in the curable epoxy resin composition is a polyepoxide. 본 발명의 실시에서 유용한 폴리에폭사이드 화합물은 적합하게는 1개 이상의 1,2-에폭시 그룹을 갖는 화합물이다. Polyepoxide compounds useful in the polyester in the practice of the invention is suitably a compound having more than one 1,2-epoxy group. 일반적으로, 폴리에폭사이드 화합물은 1개 이상의 1,2-에폭시 그룹을 갖는 포화 또는 불포화 지방족, 지환족, 방향족 또는 헤테로방향족 화합물이다. In general, the polyepoxide compound to the polyester is a saturated or unsaturated aliphatic, cycloaliphatic, aromatic or heterocyclic aromatic compound having more than one 1,2-epoxy group. 폴리에폭사이드 화합물은 저급 알킬 및 할로겐과 같은 1개 이상의 치환체로 치환될 수 있다. Polyepoxide compound to the polyester may be substituted with one or more substituents such as lower alkyl and halogen. 이러한 폴리에폭사이드 화합물은 당업계에 잘 알려져 있다. Polyepoxide compounds such polyester are well known in the art. 본 발명의 실시에 유용한 폴리에폭사이드 화합물의 예들이 개시되어 있다(참조: Handbook of Epoxy Resins, HE Lee 및 K. Neville 저, 1967년 출판, McGraw-Hill, New York, 및 미국 특허 제4,066,628호). It discloses examples of the polyepoxide compound useful in the practice of the invention poly (see: Handbook of Epoxy Resins, Lee and K. Neville HE low, published in 1967, McGraw-Hill, New York, and U.S. Patent No. 4,066,628 ). n은 1 내지 8 미만의 평균값을 갖는다. n has an average value of less than 1 to 8. 본 발명의 일례로서, 본 발명에 사용할 수 있는 공지된 에폭시 수지의 예로는 레소르시놀, 카테콜, 하이드로퀴논, 비스페놀, 비스페놀 A, 비스페놀 AP(1,1-비스(4-하이드록시페닐)-1-페닐 에탄), 비스페놀 F, 비스페놀 K, 테트라브로모비스페놀 A, 페놀-포름알데히드 노볼락 수지, 알킬 치환된 페놀-포름알데히드 수지, 페놀-하이드록시벤즈알데히드 수지, 크레솔-하이드록시벤즈알데히드 수지, 디사이클로펜타디엔-페놀 수지, 디사이클로펜타디엔-치환된 페놀 수지, 테트라메틸비페놀, 테트라메틸-테트라브로모비페놀, 테트라메틸트리브로모비페놀, 테트라클로로비스페놀 A 및 이들의 조합의 디글리시딜 에테르가 포함된다. As an example of the present invention, examples of known epoxy resins useful for the present invention include resorcinol, catechol, hydroquinone, bisphenol, bisphenol A, bisphenol AP (1,1- bis (4-hydroxyphenyl) 1-phenylethane), bisphenol F, bisphenol K, tetrabromobisphenol a, phenol-formaldehyde novolac resins, alkyl substituted phenol-formaldehyde resins, phenol-hydroxybenzaldehyde resins, cresol-hydroxybenzaldehyde resins , dicyclopentadiene-phenol resins, dicyclopentadiene-substituted phenol resins, tetramethyl biphenol, tetramethyl-tetra-bromobiphenyl phenol, tetramethyl root rib tombstones phenol, tetrachloro bisphenol a and the diglycidyl combinations thereof It includes sidil ether. 본 발명에 특히 유용한 디에폭사이드의 예로는 2,2-비스(4-하이드록시페닐) 프로판(일반적으로 비스페놀 A라 부른다)의 디글리시딜 에테르 및 2,2-비스(3,5-디브로모-4-하이드록시페닐) 프로판(일반적으로 테트라브로모비스페놀 A라 부른다)의 디글리시딜 에테르가 포함된다. 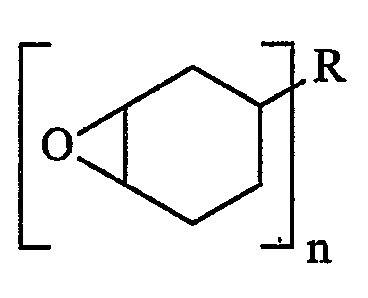 Examples of diepoxides particularly useful in the present invention are 2,2-bis (4-hydroxyphenyl) propane (generally called bisphenol A) diglycidyl ether and 2,2-bis (3,5-di a-bromo-4-hydroxyphenyl) propane diglycidyl ether (commonly referred to as tetrabromobisphenol a phenol) is included. 2종 이상의 폴리에폭사이드의 혼합물도 본 발명의 실시에 사용가능하다. Mixture of epoxide in 2 or more kinds of poly also be used in the practice of the invention. 본 발명의 실시에서 사용가능한 기타의 유용한 에폭사이드 화합물은 지환족 에폭사이드이다. Useful epoxide compound of the available other in the practice of the invention is a cycloaliphatic epoxide. 지환족 에폭사이드는 예로서 하기 화학식으로 예시된 바와 같이 탄소 환 내의 2개의 인접한 원자에 결합된 에폭시 산소를 갖는 포화된 탄소 환으로 이루어진다. Cycloaliphatic epoxide as illustrated by the general formula below, as for example consists of a saturated carbon ring having an epoxy oxygen bonded to two adjacent carbon atoms in the ring. R 및 n은 위에서 정의된 바와 같다. R and n are as defined above. 지환족 에폭사이드는 모노에폭사이드, 디에폭사이드, 폴리에폭사이드 또는 이들의 혼합물일 수 있다. Cycloaliphatic epoxides are the polyepoxides, diepoxides, poly mono be a polyepoxide, or a mixture thereof. 예컨대, 미국 특허 제3,686,359호에 기재된 임의의 지환족 에폭사이드를 본 발명에 사용할 수 있다. For example, any of the cycloaliphatic epoxide described in U.S. Patent No. 3,686,359 can be used in the present invention. 예로서, 본 발명에 사용될 수 있는 지환족 에폭사이드는 (3,4-에폭시사이클로헥실-메틸)-3,4-에폭시-사이클로헥산 카복실레이트, 비스-(3,4-에폭시사이클로헥실) 아디페이트, 비닐사이클로헥센 모노옥사이드 및 이들의 혼합물이 포함된다. For example, the cycloaliphatic epoxides that may be used in the present invention are (3,4-epoxycyclohexyl-methyl) -3,4- epoxy-cyclohexane carboxylate, bis- (3,4-epoxycyclohexyl) adipate , it includes vinyl cyclohexene monoxide, and mixtures thereof. 본 발명의 에폭시 수지 조성물에 사용되는 폴리에폭사이드 대 경화제의 비는 생성되는 열경화성 수지의 열적 특성이 유지되도록 정한다. The ratio of polyepoxide curing agent for the polyester used in the epoxy resin composition of the present invention is determined to maintain the thermal properties of the thermosetting resin to be produced. 에폭시 수지 조성물에 사용되는 경화제 조성물의 양은 에폭시 대 경화제의 몰 비가 0.5:1.0 내지 2.0:1.0, 바람직하게는 0.8:1.0 내지 1.2:1.0, 가장 바람직하게는 0.9:1.0 내지 1.1:1.0으로 되도록 한다. The curing agent composition the amount epoxy for the curing agent to be used in the epoxy resin composition molar ratio of 0.5: 1.0 to 2.0: 1.0, preferably from 0.8: 1.0 to 1.2 to 1.0, most preferably from 0.9: such that a 1.0: 1.0 to 1.1. 폴리에폭사이드 및 경화제 조성물 이외에, 본 발명의 에폭시 수지 조성물은 임의 성분으로서 촉매를 함유할 수 있다. In addition to width of the polycide and hardener composition, the epoxy resin composition of the present invention may contain a catalyst as an optional component. 촉매는 단일 성분이거나 2종 이상의 상이한 촉매들의 혼합물일 수 있다. The catalyst may be a single component or a mixture of the different catalyst of two or more thereof. 본 발명에 유용한 촉매는 폴리에폭사이드와 가교결합제와의 반응을 촉매하고 저온에서 억제제의 존재하에 잠재적으로 잔존하는 촉매이다. Catalysts useful in the present invention is a catalyst for the reaction of the polyepoxide with the cross-linking agent in the polyester and the catalyst, potentially remaining in the presence of the inhibitor at lower temperatures. 바람직하게 촉매는 140℃ 이하, 더욱 바람직하게는 150℃ 이하의 온도에서 잠재성을 갖는다. Preferably the catalyst has a potential at 140 ℃ or less, more preferably a temperature not higher than 150 ℃. 잠재성은 150℃ 내지 170℃에서 수행된 스트로크(stroke) 경화 시험으로 측정한바 겔화 시간이 10% 이상 증가한 것으로 증명된다. To prove this potential is hanba gel time measured by the stroke (stroke) cure test performed at 150 ℃ to 170 ℃ increased by over 10%. 바람직한 촉매의 예는 아민, 포스핀, 헤테로사이클릭 질소, 암모늄, 포스포늄, 아르소늄 또는 설포늄 잔기를 함유하는 화합물이다. Examples of preferred catalysts are compounds containing amine, phosphine, heterocyclic nitrogen, ammonium, phosphonium, or sulfonium moieties are sonyum. 더욱 바람직한 촉매의 예는 헤테로사이클릭 질소 및 아민 함유 화합물이며, 더욱 바람직한 화합물은 헤테로사이클릭 질소 함유 화합물이다. Examples of more preferred catalysts are the heterocyclic nitrogen and amine-containing compounds, more preferred compounds are nitrogen-containing heterocyclic compound. 미국 특허 제4,925,901호에 기재된 임의의 익히 공지된 촉매가 본 발명에 사용될 수 있다. Any well-known catalysts described in U.S. Patent No. 4,925,901 can be used in the present invention. 본 발명에 사용할 수 있는 공지된 촉매의 예로는 에틸트리페닐 포스포늄 아세테이트, 에틸트리페닐 포스포늄 아세테이트-아세트산 착물, 트리에틸아민, 메틸 디에탄올아민, 벤질디메틸아민과 같은 적합한 오늄 또는 아민 화합물, 및 2-메틸이미다졸 및 벤즈이미다졸과 같은 이미다졸 화합물이 포함된다. Examples of known catalysts useful for the present invention include ethyl triphenylphosphonium acetate, ethyl triphenylphosphonium acetate-acetic acid complex, triethylamine, methyl diethanolamine suitable onium or amine compounds such as amine, benzyldimethylamine, and is 2-methyl include imidazole compounds such as imidazole and benzimidazole. 촉매는, 존재하는 경우, 약간의 가교결합과 함께 에폭시 수지를 실질적으로 완전히 경화시키기에 충분한 양으로 사용한다. The catalyst, if present, is used in an amount sufficient to substantially fully cure the epoxy resin, with some crosslinking. 예를 들면, 촉매는 수지 100부당 0.01 내지 5부, 바람직하게는 수지 100부당 0.01 내지 1.0부, 더욱 바람직하게는 수지 100부당 0.02 내지 0.5부의 양으로 사용할 수 있다. For example, the catalyst may be used in an amount of 0.01 to 5 parts per 100 parts of resin, preferably from 0.01 to 1.0 parts per 100 parts resin, more preferably from 0.02 to 0.5 parts per 100 parts of resin. 본 발명에 사용되는 성분들의 농도는 달리 언급하지 않는 한 수지 100중량부에 대한 성분들의 중량부(phr)로서 나타낸다. Concentration of the components used in the present invention are shown as parts by weight (phr) of the components for the resin 100 parts by weight unless otherwise indicated. "phr"에서 "수지"는 조성물 중의 폴리에폭사이드와 경화제를 함께 일컫는다. In "phr", "resin" refers to the polyepoxide and the hardener together in the composition in a poly. 본 발명의 에폭시 수지 조성물에 유용한 다른 임의의 성분은 반응 억제제이다. Other optional components useful in the epoxy resin composition of the present invention is a reaction inhibitor. 반응 억제제는 붕산; Inhibitor is boric acid; 알킬 보레이트, 알킬 보란, 트리메톡시보록신과 같은 붕소를 함유하는 루이스산; Alkyl borate, alkyl borane, trimethoxy borok Lewis acids containing boron such gods; 과염소산, 테트라플루오로붕산과 같은 약한 친핵성 음이온을 갖는 산; Perchloric acid, tetrafluoro acid having a weak nucleophilic anion, such as boric acid; 및 살리실산, 옥살산 및 말레산과 같은 pKa 1 내지 3의 유기산을 포함할 수 있다. And salicylic acid, oxalic acid and maleic acid, such pKa may include an organic acid of 1 to 3. 본 명세서에서 사용된 붕산이란 메타붕산 및 붕산 무수물, 및 알킬 보레이트 또는 트리메톡시보록신과 같은 루이스산과 붕소염의 혼합물을 포함한 붕산 또는 이의 유도체를 일컫는다. The acid is used in this specification refers to metaboric acid and boric anhydride, and an alkyl borate, or trimethoxy borok acid or derivatives thereof, including Lewis acid boron salt mixture such as GOD. 본 발명에 억제제를 사용하는 경우에는 붕산을 사용함이 바람직하다. When using the inhibitor to the present invention, it is preferred to use boric acid. 억제제 및 촉매는 본 발명의 에폭시 수지 조성물에 임의의 순서로 따로따로 첨가하거나, 착물로서 첨가할 수 있다. Inhibitor and catalyst may be added separately, or added as a complex in any order to the epoxy resin composition of the present invention. 본 발명의 에폭시 수지 조성물 중의 촉매에 대한 억제제의 양은 에폭시 수지 조성물의 겔화 시간을 조절하도록 조정이 가능하다. The amount of inhibitor for the catalyst in the epoxy resin composition of the present invention the adjustment is possible so as to adjust the gel time of the epoxy resin composition. 일정 농도의 촉매에서 억제제의 양이 증가하면 그에 상응하여 겔화 시간이 증가하게 될 것이다. When the amount of the inhibitor concentration increasing in a certain catalyst will correspondingly increase the gel time thereof. 원하는 촉매 농도에서 겔화 시간을 줄이기 위해서 억제제의 상대적 양을 감소시킬 수 있다. In order to reduce the gel time in a desired catalyst concentration it may reduce the relative amount of inhibitor. 겔화 시간을 증가시키기 위해서 촉매 농도를 변화시키지 않고 억제제의 양을 증가시킬 수 있다. It can increase the amount of the inhibitor without changing the catalyst concentration in order to increase the gel time. 억제제(또는 상이한 억제제들의 혼합물) 대 촉매의 몰 비는 억제제를 함유하지 않는 유사한 조성물에 비해 겔화 시간의 증가로 증명되듯이 폴리에폭사이드의 반응을 현저하게 억제하기에 충분한 비이다. The molar ratio of inhibitor to catalyst (or mixture of different inhibitors) is a ratio sufficient to prove Just as significantly the reaction of the polyepoxide in the polyester to an increase in gel time as compared to a similar composition containing no inhibitor suppressed. 겔화 시간을 증가시키면서도 승온에서 완전한 경화를 가능케하는 억제제 또는 혼합물의 특정 농도를 간단한 실험을 통해 결정할 수 있다. While still increasing the gel time can be determined by a simple experiment a concentration of a specific inhibitor or a mixture which enables a complete cure at elevated temperatures. 예를 들어, 5.0phr 이하의 붕산이 사용되는 경우 억제제 대 촉매의 바람직한 몰 비는 0.1:1.0 내지 10.0:1.0, 더욱 바람직하게는 0.4:1.0 내지 7.0:1.0이다. For example, a preferred molar ratio of inhibitor to catalyst when the acid used is less than 5.0phr 0.1: 1.0 to 10.0: 1.0, more preferably 0.4: 1.0: 1.0 to 7.0. 본 발명의 에폭시 수지 조성물에 첨가할 수 있는 다른 임의의 성분은 용매 또는 용매 배합물이다. Other optional ingredients that may be added to the epoxy resin composition of the present invention is a solvent or solvent blend. 에폭시 수지 조성물에 사용되는 용매는 바람직하게는 혼화 가능하다. The solvent used in the epoxy resin composition can be preferably blended. 또한, 에폭시/경화제 와니스를 함유하는 본 발명의 경화제 조성물은 조성물에 사용되는 임의의 용매에 따라서 투명 용액이거나 안정한 분산액이다. Further, curing agent compositions of the present invention containing the epoxy / hardener varnish is a clear solution or a stable dispersion depending on the optional solvent used in the composition. 본 발명에 사용되는 적합한 용매의 예로는 케톤, 에테르, 아세테이트, 방향족 탄화수소, 사이클로헥사논, 디메틸포름아미드 및 이들의 배합물이 포함된다. Examples of suitable solvents for use in the present invention include the ketones, ethers, acetates, aromatic hydrocarbons, cyclohexanone, dimethylformamide and combinations thereof. 촉매 및 억제제에 바람직한 용매는 극성 용매이다. Preferred solvents for the catalyst and the inhibitor are polar solvents. 예컨대 메탄올과 같은 1 내지 20개의 탄소원자를 갖는 저급 알코올은, 양호한 용해성과 프리프레그 성형시 수지 매트릭스로부터 제거하기 위한 휘발성을 제공한다. Such as lower alcohol having 1 to 20 carbon atoms such as methanol, provides for removing a volatile from a good solubility and prepreg molding when the resin matrix. 극성 용매는 붕산 또는 붕소 유래의 루이스산의 억제제를 용해시키는 데에 특히 유용하다. Polar solvents are particularly useful to dissolve inhibitors of boric acid or Lewis acids of boron derived. 극성 용매가 하이드록시를 함유하는 경우, 용매의 하이드록시 잔기와 옥시란 환 개방시 형성된 제2의 하이드록실 사이에 유효 카복실산 무수물에 대한 잠재적인 경쟁이 존재하게 된다. When a polar solvent containing a hydroxyl, is a potential competition for available carboxylic acid anhydride between the hydroxy moiety of the solvent present in the oxirane hydroxyl of the second formed upon ring opening. 따라서, 하이드록실 잔기를 갖지 않는 극성 용매, 예를 들면, N-메틸-2-피롤리돈, 디메틸설폭시드, 디메틸포름아미드 및 테트라하이드로푸란이 유용하다. Thus, a polar solvent having no hydroxyl moieties, for example, a N- methyl-2-pyrrolidone, dimethyl sulfoxide, dimethylformamide and tetrahydrofuran are useful. 임의로 에테르 잔기를 함유하는 디하이드록시 및 트리하이드록시 탄화수소, 또는 2개 또는 3개의 하이드록실 그룹을 갖는 글리콜 에테르도 유용하다. Optionally dihydroxy and trihydroxy hydrocarbons, or two or glycol ethers having three hydroxyl groups containing ether moieties are also useful. C 2-4 디- 또는 트리하이드록시 화합물, 예를 들면, 1,2-프로판 디올, 에틸렌 글리콜 및 글리세린이 특히 유용하다. C 2-4 di- or trihydroxy compounds, for example 1,2-propanediol, ethylene glycol and glycerin are especially useful. 용매의 폴리하이드록시 관능화도는 용매가 쇄 연장제로서, 또는 보조-가교결합제에 관하여 앞서 설명된 가능한 메카니즘에 따라 보조-가교결합제로서 작용할 수 있도록 한다. Polyhydroxy functional affinity of the solvent is the solvent as a chain extender, or secondary - so can act as a crosslinking agent Accessories according to the possible mechanism previously described with respect to a crosslinking agent. 에폭시 수지 조성물에 사용되는 용매의 총량은 일반적으로 20 내지 60중량%, 바람직하게는 30 내지 50중량%, 가장 바람직하게는 35 내지 45중량%일 수 있다. The total amount of solvent used in the epoxy resin composition may be generally from 20 to 60% by weight, preferably 30 to 50% by weight, most preferably 35 to 45% by weight. 본 발명에 따르는 경화성 에폭시 수지 조성물은 충전제, 염료, 안료, 요변성제, 계면활성제, 유동성 조절제, 안정제, 가공 보조 희석제, 접착 증진제, 유연제, 강인화제 및 내연제와 같은 유용한 첨가제들을 함유할 수 있다. The curable epoxy resin compositions according to the invention may contain useful additives such as fillers, dyes, pigments, thixotropic agents, surfactants, fluidity control agents, stabilizers, processing aids diluents, adhesion promoters, softener, robust agents and flame retardants. 본 발명의 경화성 에폭시 수지 조성물은 조성물의 모든 성분들을 임의의 순서로 함께 혼합하여 제조할 수 있다. The curable epoxy resin composition of the present invention can be prepared by mixing together all the components of the composition in any order. 달리, 본 발명의 경화성 에폭시 수지 조성물은 에폭시 수지 성분을 함유하는 제1 조성물과 경화제 조성물 성분을 함유하는 제2 조성물을 제조함으로써 제조할 수 있다. Alternatively, the curable epoxy resin composition of the present invention can be produced by preparing a first composition containing a first composition and curing agent composition component containing the epoxy resin component. 에폭시 수지 조성물을 제조하는 데 유용한 다른 모든 성분들은 동일한 조성물 중에 존재하거나, 일부는 제1 조성물 중에 존재하고 일부는 제2 조성물 중에 존재할 수 있다. All other components useful in preparing the epoxy resin composition are present in the same composition, or some are present in the first composition, and some may be present in the second composition. 이후, 제1 조성물을 제2 조성물과 혼합하여 경화성 에폭시 수지 조성물을 형성한다. Then, the mixture of the first composition and the second composition to form the curable epoxy resin composition. 그런 다음 에폭시 수지 조성물 혼합물을 경화시켜서 에폭시 수지 열경화성 재료를 제조한다. Then, by curing the epoxy resin composition mixture to produce an epoxy resin thermoset material. 바람직하게는, 경화성 에폭시 수지 조성물은 조성물의 성분들이 용매에 용해되어 있는 용액 형태이다. Preferably, the curable epoxy resin composition is in solution form with components of the composition are dissolved in a solvent. 이러한 용액 또는 와니스는 코팅된 제품을 제조하는 데에 사용된다. Such solution or varnish is used for making a coated article. 본 발명의 경화성 에폭시 수지 조성물은 코팅물이 요구되는 임의의 제품을 코팅하는 데에 사용될 수 있다. The curable epoxy resin composition of the present invention can be used to coat any of the products that require coating. 제품을, 예를 들면, 분말-코팅법, 분무-코팅법, 조성물이 담긴 욕조에 제품을 접촉시키는 방법을 포함한 당업자들에게 알려진 임의의 방법을 사용하여 본 발명의 조성물로 코팅할 수 있다. The product, for example, powder-coating, spray-coating can be a coating method, the composition of the present invention using any method known to those skilled in the art, including the method of the composition is in contact with the product contained in the bath. 이와 같이 제품을 에폭시 수지 조성물로 코팅하고, 코팅물을 부분적으로 경화하거나 완전히 경화할 수 있다. In this way the product was coated with an epoxy resin composition, or the cured coating can be partially cured completely. 코팅물을 부분적으로 경화하는 양태에서는 부분적으로 경화된 수지가 최종적으로 경화될 수 있도록 제품을 추가로 가공처리할 수 있다. In the aspect of the cured coating it may be in part the partially cured resin to be processed by adding the product to be finally cured. 코팅된 제품은 임의의 기재, 예를 들면, 금속, 시멘트 및 보강재일 수 있다. The coated product may be any substrate, for example metal, cement and reinforcing material. 한 양태에서, 제품은 복합재, 프리프레그 또는 적층물을 위한 섬유 보강재이다. In one embodiment, the product is a fiber reinforcing material for composites, prepregs or laminates. 본 발명에 따르는 경화성 에폭시 수지 조성물은 특히 전자 공학, 건축, 항공 및 자동차 산업을 위한 복합재를 제조하는 데에 사용될 수 있다. The curable epoxy resin composition according to the present invention can be used in particular for producing a composite material for the electronics, construction, aviation, and automobile industries. 본 발명의 경화성 에폭시 수지 조성물은 보강재를 용융 또는 용해된 수지로 함침시키는 방법, 또는 수지 이송 성형법, 필라멘트 와인딩(filament winding), 인발 성형법 또는 RIM(반응 사출 성형) 및 기타의 성형법, 캡슐화 또는 코팅 기술과 같이 산업에 잘 알려져 있는 기술에 의해 복합재 재료를 제조하는 데에 사용될 수 있다. The curable epoxy resin composition of the present invention provides a method of impregnating a reinforcing material with molten or dissolved resin, or resin transfer molding, filament winding (filament winding), pull-out molding method or the RIM (reaction injection molding) and other molding methods, encapsulation, or coating techniques by techniques well known in the industry, such as it may be used to manufacture the composite material. 또한, 본 발명에 따르는 경화성 에폭시 수지 조성물은 아교, 코팅, 성형 수지, 포매 수지, 캡슐화 수지, 시트 성형 화합물 또는 벌크 성형 화합물과 같은 통상의 에폭시 수지의 용도로서 사용될 수 있다. Further, curable epoxy resin compositions according to the invention can be used as the use of a conventional epoxy resin such as a glue, coating, molding resin, embedding resin, encapsulating resin, sheet molding compound or bulk molding compound. 본 발명의 에폭시 수지 조성물은 산업에서 주지된 기술을 사용하여, 예를 들면, 인쇄 회로 기판을 위한 B-스테이지 처리의 프리프레그 및 적층물을 제조하는 데에 특히 유용하다. The epoxy resin composition of the present invention using well-known techniques in the industry, for example, is particularly useful for preparing a prepreg and a laminate of a B- stage process for a printed wiring board. 본 발명은 바람직하게는 본 발명의 에폭시 수지 조성물을 포함하는 전자 산업에 사용하기 위한 적층물에 관한 것이다. The invention preferably relates to a laminate for use in the electronics industry, including the epoxy resin composition of the present invention. 수지 조성물이 단순한 이관능성의 에폭시 화합물을 기재로 하는 경우에서조차 본 발명에 따르는 수지 성분들의 조합은 전자 산업에 응용하기 위한 뛰어난 특성들을 제공하는 것으로 밝혀졌다. Even in the case that the epoxy compound of the transfer is just a functional resin composition as a base material combination of resin components according to the present invention it has been found to provide superior properties for applications in the electronics industry. 일반적으로, 전자 산업에 사용하기 위한 적층물, 특히 인쇄 회로 기판을 위한 적층물은 지지 또는 보강 재료를 본 발명의 에폭시 수지 조성물로 함침시킨 후, 수지를 완전히 또는 부분적으로 경화시켜서 제조한다. In general, after manufacture the laminate for the laminate, in particular a printed circuit board for use in the electronics industry is impregnated with a supporting or reinforcing material with the epoxy resin composition of the present invention, to cure the resin fully or partially. 부분적으로 경화된 수지로 함침된 보강 재료를 일반적으로 "프리프레그"라고 부른다. In the partially cured resin-impregnated reinforcing material generally referred to as a "prepreg". 프리프레그로부터 인쇄 회로 기판을 제조하기 위하여, 1개 이상의 프리프레그 층을 1개 이상의 금속 재료(예: 구리)의 층들과 함께 적층시킨다. In order to prepare the prepreg from which the printed circuit board, one or more prepreg layers of one or more metal products: are laminated with layers of (for example, copper). 본 발명의 에폭시 수지 조성물로 함침될 수 있는 보강 재료로는 복합재, 프리프레그 및 적층물의 제조에서 당업자에 의해 사용되는 임의의 재료가 포함된다. A reinforcing material that is impregnated with the epoxy resin composition of the present invention include any material used by those skilled in the composite material, a prepreg and laminate manufacture. 이러한 보강 재료의 형태의 예로는 직물, 천, 메쉬, 웹 또는 섬유; Examples of embodiment of such reinforcing material is fabric, cloth, mesh, web, or fibers; 또는 단일 방향으로 배향된 평행 필라멘트들의 크로스-플라이(cross-ply) 적층물이 포함된다. Or cross of the parallel filaments oriented in a single direction - are included plies (cross-ply) laminate. 일반적으로, 이러한 보강 재료는 유리 섬유, 종이, 방향족 폴리아미드와 같은 플라스틱, 흑연, 유리, 석영, 탄소, 붕소 섬유, 및, 예를 들면, 아라미드, 테프론, 신디오택틱 폴리스티렌과 같은 유기 섬유를 포함한 각종 재료, 더욱 구체적으로는 인쇄 회로 기판용 적층물을 제조하기 위한 각종 재료로 만들어진다. Generally, such reinforcing materials include an organic fiber, such as plastic, graphite, glass, quartz, carbon, boron fibers, and, for example, aramid, teflon, syndiotactic polystyrene, such as glass fibers, paper, aromatic polyamide various materials, more specifically, is made of various materials for the production of laminates for printed circuit boards. 한 바람직한 양태에서, 보강 재료는 천 또는 웹 형태의 유리 또는 섬유 유리를 포함한다. In one preferred embodiment, the reinforcing material is glass cloth or comprises a glass fiber or a web form. 본 응용의 일례로서, 본 발명에 따르는 에폭시 수지 조성물은 예컨대 유리 직물을 함침시키는 데에 매우 적합하다. As an example of the present application, the epoxy resin composition according to the invention are for example very suitable for impregnating a glass fabric. 본 발명의 한 양태에서는 보강 재료를 욕조 안에서 본 발명의 에폭시 수지 조성물과 접촉시킨다. In one aspect of the invention is contacted with the epoxy resin composition of the present invention the reinforcing material in the bath. 바람직하게 욕조는 40 내지 90%의 고형분을 함유한다. Preferably bath contains a solids content of 40 to 90%. 이러한 욕조에서, 에폭시 수지 조성물의 각종 성분들은 욕조 내에서 용해 또는 현탁된다. In such a bath, the various components of the epoxy resin composition are dissolved or suspended in the bath. 욕조에는 단일 용매 또는 용매 배합물이 사용될 수 있으나, 다수의 경우 혼합물에 첨가되는 각각의 성분에 대하여 별개의 용매가 사용된다. Bath has a separate solvent is used for each component added to the mixture in many cases, it may be used a single solvent or solvent blend. 사용되는 각종 용매들은 서로 혼화가능한 것이 바람직하다. Various solvents used are preferably miscible with each other as possible. 이러한 용매 또는 희석제로는 경화되기 전에 조성물로부터 휘발 또는 방출되는 것들이 포함된다. This is a solvent or diluent include those which are volatile or released from the composition before it is cured. 에폭시 수지에 바람직한 용매는 아세톤 및 메틸 에틸 케톤을 포함하는 케톤이다. Preferred solvents for the epoxy resins are ketones, including acetone and methyl ethyl ketone. 경화제 조성물에 바람직한 용매는 약간 극성의 용매, 아미드, 예를 들면, 디메틸포름아미드, 에테르 알코올, 예를 들면, 에틸렌 글리콜의 메틸, 에틸, 프로필 또는 부틸 에테르, 메틸, 에틸, 프로필 또는 부틸의 케톤, 디프로필렌 글리콜, 에틸렌 글리콜 모노메틸에테르, 1-메톡시-2-프로판올, 톨루엔, 크실렌 메톡시프로필 아세테이트, 2-에톡시에틸 아세테이트, 및 용매의 혼합물이다. Preferred solvents for the hardener composition are slightly example of the solvent, an amide, and examples of polar, dimethylformamide, ether alcohols, e.g., methyl glycol, ethyl, propyl or butyl ethers, methyl, ethyl, propyl or ketone-butyl, D is a mixture of propylene glycol, ethylene glycol monomethyl ether, 1-methoxy-2-propanol, toluene, xylene and methoxypropyl acetate, methoxyethyl acetate, and the solvent 2. 촉매 및 억제제는, 예를 들면, 극성 용매, 특히 알코올, 바람직하게는 저급 알코올, 가장 바람직하게는 메탄올에 용해시킴이 바람직하다. Catalysts and inhibitors, for example, are preferred dissolving in a polar solvent, especially an alcohol, preferably a lower alcohol, most preferably methanol. 억제제가 액체이거나 비극성 용매 중의 높은 용해도를 갖는 경우, 케톤을 사용할 수 있다. If the inhibitor has a high solubility in the liquid or non-polar solvents, ketones may be used. 본 발명의 한 양태에서는, 먼저 용매 중의 폴리에폭사이드, 용매 중의 폴리에폭사이드를 위한 본 발명의 경화제 조성물, 임의로 극성 용매 중의 붕산과 같은 개시제, 및 임의로 극성 용매 중에서 폴리에폭사이드와 경화제의 경화 반응을 촉매하는 화합물을 함유하는, 친밀하게 혼합된 에폭시 수지 조성물의 욕조에 보강 재료를 접촉시키는 단계를 포함하는 방법에 의해, 본 발명의 에폭시 수지 조성물 및 보강 재료로부터 프리프레그를 제조한다. In one aspect of the invention, the first solvent is poly in the width of the side, curing agent compositions of the present invention for the polyepoxide in a solvent, an initiator, such as optionally boric acid in a polar solvent, and optionally a polyepoxide and a curing agent for polyester in a polar solvent in the by a process comprising the step of contacting a reinforcing material, the intimacy of the bath of mixed epoxy resin composition containing a compound which catalyzes the curing reaction, to produce a prepreg from the epoxy resin composition and the reinforcing material of the present invention. 보강 재료를 욕조 중의 에폭시 수지 조성물에 함침시킨다. It is impregnated with a reinforcing material to the epoxy resin composition in the bath. 그런 다음, 수지에 함침된 보강 재료를 조성물 중의 용매를 증발시키기에 충분한 온도에서, 그러나 가열 대역 내에서의 체류 시간 동안 폴리에폭사이드가 완전히 경화되는 온도보다는 낮은 온도에서 가열 대역에 통과시킨다. Then, the impregnated reinforcement material at a temperature sufficient for the resin to evaporate the solvent in the composition, however, passed through a heated zone at a temperature lower than the temperature at which the polyepoxide is fully cured during the residence time in the heated zone polyester. 보강 재료의 욕조에서의 체류 시간은 바람직하게는 0.1분 내지 10분, 더욱 바람직하게는 0.3분 내지 8분, 가장 바람직하게는 0.5분 내지 3분이다. The residence time in the bath of the reinforcing material is preferably 0.1 minutes to 10 minutes, more preferably from 0.3 minutes to 8 minutes, most preferably from 0.5 minutes to 3 minutes. 이러한 욕조의 온도는 바람직하게는 0℃ 내지 100℃, 더욱 바람직하게는 10℃ 내지 40℃, 가장 바람직하게는 15℃ 내지 30℃이다. The temperature of such bath is preferably from 0 ℃ to 100 ℃, more preferably from 10 ℃ to 40 ℃, most preferably from 15 ℃ to 30 ℃. 수지에 함침된 보강 재료의 가열 대역 내에서의 체류 시간은 0.5 내지 15분, 더욱 바람직하게는 1 내지 10분, 가장 바람직하게는 1.5 내지 5분이다. Residence time in the heated zone of the impregnated reinforcing material in the resin is 0.5 to 15 minutes, more preferably 1 to 10 min, most preferably 1.5 to 5 minutes. 가열 대역의 온도는 에폭시 수지 조성물에 잔존하는 모든 용매를 휘발시키기에 충분하지만 에폭시 수지 조성물 중의 성분들을 완전히 경화시킬 정도로 높지는 않다. The temperature of the heated zone is sufficient to volatilize all solvents remaining in the epoxy resin composition but is not high enough to completely cure the components in the epoxy resin composition. 이러한 가열 대역의 바람직한 온도는 80℃ 내지 230℃, 더욱 바람직하게는 100℃ 내지 200℃, 가장 바람직하게는 150℃ 내지 180℃이다. The preferred temperature of the heated zone is 80 ℃ to 230 ℃, more preferably from 100 ℃ to 200 ℃, most preferably from 150 ℃ to 180 ℃. 바람직하게, 가열 대역에서는 불활성 기체를 가열 대역(오븐일 수 있다)에 통과시키거나 오븐을 약간 진공 상태로 만듦으로써 휘발성 용매를 제거하는 몇 가지 수단이 있다. Preferably, the heated zone there is some means for removing volatile solvent by making a pass in the heated zone (which can be an oven) with an inert gas or a vacuum oven slightly. 다른 양태에서, 함침된 보강 재료를 온도가 높아지는 대역들에 노출시킬 수 있다. In another aspect, it is possible to expose the impregnated reinforcement material to a higher temperature range. 예를 들면, 제1 대역은 용매를 휘발시켜서 용매를 제거할 수 있도록 고안하고, 이어지는 대역들은 폴리에폭사이드를 부분적으로 경화시키도록, 다시 말해 이른바 B-스테이지 처리를 수행하여 프리프레그를 형성하도록 고안한다. For example, the first band is devised to thereby evaporate the solvent The solvent was removed and to the subsequent bands are partially cure the polyepoxide, in other words a so-called Do B- staging to form the prepreg devise. 본 발명의 한 양태에서는 상기 제조한 프리프레그의 복수 개의 층, 세그먼트 또는 부분들을 서로 접촉시켜서 프리프레그 재료로부터 적층물을 제조한다. In one aspect of the invention by a plurality of layers, segments or parts of the above prepared prepreg in contact with each other to prepare a laminate from the prepreg material. 그런 다음, 접촉된 층, 세그먼트 또는 부분들을 수지 조성물 중의 에폭시 수지 성분을 완전히 경화시키기에 충분한 승압 및 승온에 노출시켜서 인접한 층, 세그먼트 또는 부분들 위의 수지가 반응하여 연속적인 에폭시 수지 매트릭스를 형성하도록 섬유 보강 재료와 함께 적층물을 형성한다. Then, by the contacted layers, segments or parts exposing a sufficient step-up and raised to fully cure the epoxy resin component in the resin composition is a resin above the adjacent layers, segments or parts react to form a continuous epoxy resin matrix the stack with the fiber-reinforced material is formed. 경화되기 전에 프리프레그 재료의 일부를 목적하는 모양 및 두께의 부분으로 절단하거나 접어서 쌓아올릴 수 있다. Before curing it can be stacked or folded and cut in a portion of the shape and thickness of the desired part of the prepreg material. 적층물을 제조하기 위한 압축 수단에서 프리프레그를 압축하는 데 사용되는 압력은 10 내지 2,000뉴턴/㎠, 바람직하게는 100 내지 1,000뉴턴/㎠일 수 있다. The pressure used in compressing the prepreg in a compression means for producing a laminate may be from 10 to 2000 Newtons / ㎠, preferably from 100 to 1000 Newtons / ㎠. 프리프레그 재료를 경화하여 적층물을 제조하는 데 사용되는 온도는 특정한 체류 시간, 사용되는 압력 및 사용되는 에폭시 수지 조성물의 구성에 따라 달라진다. The temperature at which the curing of the prepreg materials used to manufacture the stack is dependent on the particular residence time, pressure used, and using the configuration of an epoxy resin composition. 일반적으로, 사용될 수 있는 경화 온도는 100℃ 내지 240℃, 바람직하게는 120℃ 내지 210℃, 더욱 바람직하게는 170℃ 내지 200℃이다. In general, cure temperatures which may be used is a 100 ℃ to 240 ℃, preferably from 120 to 210 ℃ ℃, and more preferably from 170 ℃ to 200 ℃. 압축 수단 내의 프리프레그 재료의 체류 시간은 30분 내지 300분, 바람직하게는 45분 내지 200분, 더욱 바람직하게는 60분 내지 120분일 수 있다. The residence time of the prepreg material in the compression means may be from 30 minutes to 300 minutes, preferably 45 min minute to 200 minutes, more preferably from 60 minutes to 120. 적층물의 제조방법의 한 양태는 연속식 공정일 수 있다. One aspect of the laminate production method of water may be a continuous process. 이러한 연속식 공정에서는 보강 재료를 오븐에서 꺼내어 목적하는 형상과 두께로 적절하게 배열한 후 매우 높은 온도에서 단시간 동안, 특히 180℃ 내지 250℃, 더욱 바람직하게는 190℃ 내지 210℃의 고온에서 1분 내지 10분 동안 압축시킨다. Such a continuous process, and then suitably arranged in the shape and thickness desired, remove the reinforcing material in an oven for a short time at very high temperatures, in particular 180 ℃ to 250 ℃, more preferably one minute at a high temperature of 190 ℃ to 210 ℃ then to 10 minutes during compression. 본 발명의 다른 양태에서는 프레스의 외부에서 적층물 또는 최종 생성물을 후-경화 단계로 처리함이 바람직할 수 있다. In another aspect of the present invention after the laminate or final product on the outside of the press-in process may be preferred that the curing step. 이러한 후-경화 단계는 경화 반응을 완결시키도록 고안된다. This post-cure step is designed to complete the curing reaction. 후-경화 단계는 일반적으로 130℃ 내지 220℃에서 20분 내지 200분간 수행한다. Post-cure step is usually performed in 130 ℃ to 220 ℃ 20 minutes to 200 minutes. 이러한 후-경화 단계는 휘발가능한 임의의 성분들을 제거하기 위하여 진공 중에서 수행할 수 있다. Such a post-curing step may be carried out in vacuum in order to remove possible volatile optional ingredients. 본 발명의 경화성 에폭시 수지 조성물로부터 제조된 완전히 경화된 궁극의 적층물은 본 발명의 범주에 속하지 않는 조성물로부터 제조된 적층물보다 종종 더 높은 Tg를 나타낸다. Present in the ultimate fully cured composition prepared from a curable epoxy resin laminate of the invention exhibits the often higher Tg than laminates prepared from compositions that do not belong to the scope of the invention. 일반적으로, 적층물의 Tg는 150℃ 내지 220℃, 바람직하게는 170℃ 내지 200℃이다. In general, the Tg of the laminate 150 ℃ to 220 ℃, preferably 170 ℃ to 200 ℃. 일반적으로, Tg는 표준 FR4 적층물보다 본 발명의 적층물이 더 높다. In general, Tg is a higher stack of the present invention than standard FR4 laminates. 강인화제가 사용되는 경우 적층물의 Tg가 감소할 수 있는 것으로 알려져 있다. When the tenacity agent used is known to laminate Tg decreases. 그러나, 본 발명의 수지 조성물을 사용한 완전하게 경화된 적층물은 유사한 겔화 시간(따라서 동일한 반응성)을 갖도록 제조한 통상의 수지를 사용하여 유사한 방법으로 제조한 적층물에 비해 이의 Tg를 유지하면서 개선된 강인성을 갖고 탈적층화 경향도 더욱 적다. However, the improved while maintaining its Tg as compared to the laminate prepared in a similar manner using a conventional resin manufactured fully cured laminate using the resin composition of the present invention to have a similar gel time (hence the same reactive) also they tend to have even less stamina taljeok stratification. 본 발명의 에폭시 수지 조성물을 사용하여 제조한 적층물은 또한, 예를 들면, 높은 내열성과 같은 이의 뛰어난 열적 특성을 유지한다. Present a laminate prepared using the epoxy resin composition of the invention may also, for example, maintains the excellent thermal properties such as high heat resistance thereof. 예로서, Td는 일반적으로 300℃ 내지 400℃, 바람직하게는 320℃ 내지 380℃, 더욱 바람직하게는 350℃를 초과한다. For instance, Td is typically exceed 300 ℃ ℃ to 400, preferably from 320 ℃ to 380 ℃, more preferably 350 ℃. 본 발명의 경화제 조성물을 사용하면 적층물의 유전 특성, 특히 Dk도 개선된다. The curing agent composition of the present invention is also improved dielectric properties of water laminate, especially Dk. 본 발명의 적층물은 표준 FR4에 비해 전형적으로 더욱 우수하다. Laminate of the present invention are typically more excellent as compared to standard FR4. Dk는 일반적으로 4.3 미만, 바람직하게는 4.2 미만, 더욱 바람직하게는 4.0 미만이다. Dk is generally less than 4.3, preferably less than, more preferably less than 4.0, 4.2. Df는 일반적으로 0.020GHz 미만, 바람직하게는 0.015GHz 미만, 더욱 바람직하게는 0.012GHz 미만, 가장 바람직하게는 0.010GHz 미만이다. Df is generally less than 0.020GHz, 0.015GHz preferably less than, more preferably less than 0.012GHz, and most preferably less than 0.010GHz. 추가로, 본 발명의 에폭시/경화제 조성물로부터 제조된, 부분적으로 경화된 B-스테이지 처리의 프리프레그는 개선된 외관을 갖고 취급 도중에 발생하는 분진이 더욱 적다. In addition, free of the partially cured B- staging as prepared from the epoxy / hardener composition of the present invention, he presence of dust generated during the treatment has an improved appearance even less. 일반적으로, 프리프레그 분진은 0.15g/m 미만, 바람직하게는 0.10g/m 미만, 더욱 바람직하게는 0.08g/m 미만이다. Generally, the prepreg dust is 0.15g / m, preferably less than 0.10g / m or less, more preferably less than 0.08g / m.
또한, 본 발명의 에폭시/경화제 조성물로부터 제조된 완전히 경화된 C-단계의 적층물은 개선된 강인성을 나타내고 탈적층화 경향이 더욱 낮다. Further, the laminate of the fully cured C- step made from an epoxy / hardener composition of the present invention shows an improved toughness is low even a tendency taljeok stratification. 일반적으로, 본 발명의 적층물은 표준 수지로부터 제조된 적층물에 비해 10% 이상의 개선율을 보이며 10배까지의 개선율을 보인다. In general, the laminates of the present invention showed a more than 10% improvement compared to the laminate made from standard resins exhibit improvement of up to 10 times. 예를 들어, 본 발명의 적층물의 탈적층화 값은 1.0J 이상 및 3.0J 이하일 수 있다. For example, the laminate taljeok stratification values ​​of the present invention can be up to more than 1.0J and 3.0J. PBMA 또는 PBMA/SBM의 배합물은 에폭시 수지 조성물 내에서 강인화제로서 작용하는 것으로 믿어진다. PBMA or PBMA / SBM in combination are believed to act as a strong agent in the epoxy resin composition. PBMA는 에폭시 그룹과 함께 반응하기 때문에 대규모의 상 분리가 방지된다. PBMA is a large-scale phase separation is prevented because the reaction with the epoxy groups. 본 발명을 하기 실시예를 참조로 추가로 예시하기로 한다. And as to further illustrate an embodiment to the present invention by reference. 하기 실시예는 본 발명을 예시하기 위함이며 본 발명의 범위를 제한하지 않는다. The following examples are intended to illustrate the invention and do not limit the scope of the invention. 달리 언급하지 않는 한, 모든 부 및 백분율은 중량 기준이다. Unless otherwise indicated, all parts and percentages are by weight. 다우아놀(Dowanol) TM PMA는 더 다우 케미칼 캄파니(The Dow Chemical Company)가 시판하는 프로필렌 글리콜 모노메틸 에테르 아세테이트이다. The elegant play (Dowanol) TM PMA is The Dow Chemical Company (The Dow Chemical Company) is a commercially available propylene glycol monomethyl ether acetate. MEK는 메틸 에틸 케톤이다. MEK is methyl ethyl ketone. SMA는 스티렌 말레산 무수물 공중합체이다. SMA is a styrene-maleic anhydride copolymer. PBMA는 말레인화된 폴리부타디엔이다. PBMA is maleic personalized polybutadiene. SBM은 스티렌-부타디엔-메틸 메타크릴레이트 트리블록 중합체이다. SBM is a styrene-methyl methacrylate triblock polymer-butadiene. SMA 3000 TM 은 아토피나(Atofina)가 시판하는 평균 분자량(Mw) 9500 및 무수물 당량 393의 스티렌-말레산 무수물 공중합체이다. SMA TM 3000 is Atofina average molecular weight (Mw) 9500 and an anhydride equivalent weight of styrene to 393 (Atofina) are commercially available - a maleic anhydride copolymer. 리콘(Ricon) TM 131MA10은 사르토머(Sartomer)가 시판하는 평균 분자량(Mn) 5000 및 무수물 당량 981의 말레인화된 폴리부타디엔이다. Silicon (Ricon) TM 131MA10 is a maleic personalized polybutadiene Sartomer (Sartomer) with an average molecular weight of commercially available (Mn) 5000 and the anhydride equivalent weight 981. 리콘 TM 130MA13은 사르토머가 시판하는 평균 분자량(Mn) 2900 및 무수물 당량 762의 말레인화된 폴리부타디엔이다. Silicon TM 130MA13 is a maleic personalized polybutadiene Sar sat meoga average molecular weight of commercially available (Mn) 2900 and the anhydride equivalent weight 762. SBM 1A17은 아토피나가 시판하는 스티렌-부타디엔-메틸 메타크릴레이트 트리블록 중합체이다. SBM 1A17 is a styrene atopic out commercially-methyl methacrylate triblock polymer-butadiene. DEN TM 438은 더 다우 케미칼 캄파니가 시판하는 에폭시 당량 180의 다관능성 에폭시 노볼락이다. DEN 438 is a TM Dow Chemical Co., epoxy equivalent of the polyfunctional epoxy 180, available novolak. DER TM 560은 더 다우 케미칼 캄파니가 시판하는 에폭시 당량 450의 브롬화된 에폭시 수지이다. DER 560 is a TM Dow Chemical Co., a brominated epoxy resin of epoxy equivalent weight 450 that you are commercially available. M780은 레우나 하제(Leuna Harze)가 시판하는 에폭시 당량 470의 브롬화된 에폭시 수지이다. M780 is a brominated epoxy resin of epoxy equivalent weight 470, which is a commercially available laxative LES Una (Leuna Harze). XU-19081.00은 더 다우 케미칼 캄파니가 시판하는 에폭시 당량 484의 브롬화된 실험용 에폭시 수지 용액이다. XU-19081.00 is an experimental brominated epoxy resin solution more of Dow Chemical Co., epoxy equivalent amount 484 that you are commercially available. Ken-React TM KR55는 켄리치 페트로케미칼 인코포레이티드(Kenrich Petrochemical Inc.)가 시판하는 티타네이트 접착 증진제이다. Ken-React KR55 TM is a titanate adhesion promoter sold Ken rich Petro Chemicals, Inc. (Kenrich Petrochemical Inc.). 2E4MI는 2-에틸-4-메틸 이미다졸 용액(비휘발성 물질 20%)이다. 2E4MI is 2-Ethyl-4-methyl imidazole solution (non-volatile matter 20%). 하이카(Hycar) TM CTBN 1300X13은 분자량(Mn)이 대략 3150이고 평균 관능화도가 대략 1.8인 카복실 말단 부타디엔-아크릴로니트릴 공중합체인 액상의 반응성 고무이다(하이카 TM 는 노베온(Noveon)의 상품명이다). Hayika (Hycar) TM CTBN 1300X13 is a molecular weight (Mn) of about 3150 and an average functional degree is about 1.8 of a carboxyl terminated butadiene-reactive rubber of a copolymer liquid acrylonitrile (hayika TM is a trade name of the furnace beon (Noveon)) . SBM 1A40은 아토피나가 시판하는 스티렌-부타디엔-메틸 메타크릴레이트 트리블록 중합체이다. SBM 1A40 is a styrene atopic out commercially-methyl methacrylate triblock polymer-butadiene. TBBA는 테트라브로모비스페놀 A이다. TBBA is tetrabromobisphenol A.
DEN TM 431은 더 다우 케미칼 캄파니가 시판하는 에폭시 당량 176의 다관능성 에폭시 노볼락이다. DEN 431 is a TM Dow Chemical Co., epoxy equivalent of the polyfunctional epoxy 176, available novolak. ERL TM 4299는 더 다우 케미칼 캄파니가 시판하는 에폭시 당량 195의 지환족 에폭시 수지이다. ERL TM 4299 is a more cycloaliphatic epoxy resin from Dow Chemical Company, epoxy equivalent amount 195 that you are commercially available. 하기 실시예에서 여러 가지 측정을 위하여 사용되는 여러 가지 실험적인 시험 및 분석 방법은 다음과 같다: A number of experimental testing and analytical methods used for various measurements in the Examples are as follows. DSC는 시차 주사 열량계를 의미한다. DSC means differential scanning calorimetry. Tg는 필름에 대해서는 10℃/분의 가열 속도, 적층물에 대해서는 20℃/분의 가열 속도에서 DSC에 의해 중간점 Tg로 측정한다. Tg is measured for 10 ℃ / min heating rate, the laminates of the film from about 20 ℃ / min heating rate to the mid-point Tg by DSC. 사용되는 방법은 IPC-TM-650 #2.4.25C이다. The method used is the IPC-TM-650 # 2.4.25C. T-300은 열역학적 분석법(TMA)에 의해 측정되는, 300℃에서 탈적층화되기까지 소요되는 시간을 의미한다. T-300 is meant the time it takes to taljeok be stratified in, 300 ℃ as measured by the thermodynamic analysis (TMA). 사용되는 방법은 IPC-TM-650-#2.4.24:1이다. The method used was IPC-TM-650- # 2.4.24: 1. CTE는 TMA에 의해 측정되는 열 팽창 계수를 의미한다. CTE refers to the coefficient of thermal expansion measured by TMA. Td는 열 중량 측정 분석법(TGA)에 의해 측정되는 열 분해 온도를 의미한다. Td refers to the thermal decomposition temperature measured by thermal gravimetric analysis (TGA). Td는 5중량% 손실률에서의 온도이다. Td is the temperature at 5% weight loss rate. CISCO 시험(288℃)은 내열 충격성의 측정이다. CISCO test (288 ℃) is a measurement of thermal shock resistance. 한 주기는 288℃에서 10초 동안 땜납 침지(solder dip) 처리한 후 주위 온도에서 대기 중에 10초 동안 켄칭하는 단계를 포함한다(1주기 = 20초). A cycle includes a step referred to Ken for 10 seconds in air at ambient temperature and then at 288 ℃ 10 seconds immersion solder (solder dip) treatment for (1 cycle = 20 seconds). E의 값이 클수록 적층물의 강인성이 우수하고 층간 접착력이 더 크다. The higher the value of E of the stack toughness is excellent at greater interlayer adhesion. 이것은 취성의 기준이기도 하다. This is also the basis of embrittlement. 구리 박리 강도는 IPC-TM-650-#2.4.8C에 설명된 방법을 사용하여 측정한다. Copper peel strength was measured using the method described in IPC-TM-650- # 2.4.8C. TMA는 열역학적 분석법을 의미한다. TMA refers to the thermodynamic analysis. 사용되는 방법은 IPC-TM-650-#2.4.24C이다. The method used is the IPC-TM-650- # 2.4.24C. 프리프레그 분진은 다음과 같이 측정한다: 폭이 30㎝인 프리프레그 시트 20장을 재단기를 사용하여 절단한다. Prepreg dust was measured as follows: cut the prepreg sheet 20 by using the width 30㎝ cutter. 프리프레그에서 발생하는 분진을 모두 모아 평량한다. The grammage collect all the dust generated in the prepreg. 프리프레그 분진의 양을 총 절단 거리에 대해 정상화한다(g/m). And the amount of prepreg dust normalized with respect to the total cutting distance (g / m). 이 실시예에서는 기계적 교반기, 가열 재킷, N 2 주입구 및 적하 깔때기가 장착된 5ℓ들이 유리 반응기 내에서 본 발명의 무수물 경화제 용액을 제조한다. In this embodiment, a mechanical stirrer, a heating jacket, N 2 inlet and a dropping funnel equipped with 5ℓ to prepare a solution of anhydride curing agent of the invention within the glass reactor. 1821.3g의 다우아놀 * PMA 및 40.3g의 SBM 1A17을 반응기에 채우고 90℃로 가열한다. 1821.3g fills the elegant play * PMA and SBM 1A17 of 40.3g of the reactor is heated to 90 ℃. 고체가 완전히 용해된 후, 1554.8g의 SMA 3000을 용액에 첨가한다. After the solid was completely dissolved, the addition of SMA 3000 was added 1554.8g of. 고체가 완전히 용해된 후 201.3g의 리콘 * 131MA10을 용액에 첨가한다. After the solid is completely dissolved is added to 201.3g of the silicone * 131MA10 was added. 이때 용액은 탁하지만 균질한 백색의 용액이다. The solution was cloudy, but a solution of a homogeneous white color. 30분 후, 용액을 80℃의 온도로 냉각시키고 80℃에서 MEK를 용액에 첨가한다. After 30 minutes, the solution was cooled to a temperature of 80 ℃ MEK was added to the solution at 80 ℃. 용액을 주위 온도(~25℃)로 완전히 냉각시킨 후, 무수물 경화제 용액은 탁하고 약간 흰색을 띠며 균질하다. After complete solution was cooled to ambient temperature (~ 25 ℃), anhydride curing agent solution is suspended and homogenized ttimyeo some white. 경화제 용액은 2개월의 시험기간 동안 상 분리 및 침전을 일으키지 않고 안정하다. A curing agent solution is stable without causing phase separation and settling during a two-month test period. 무수물 경화제 용액의 이론적인 무수물 당량은 432이다(고형분 기준). The theoretical anhydride equivalent weight of the anhydride hardener solution was 432 (based on solids). 기계적 교반기, 가열 재킷, N 2 주입구 및 적하 깔때기가 장착된 5ℓ들이 유리 반응기 내에서 표준 무수물 경화제 용액을 제조한다. A mechanical stirrer, a heating jacket, N 2 inlet and a dropping funnel equipped with 5ℓ to prepare a standard anhydride hardener solution in the glass reactor. 2000.0g의 다우아놀 * PMA 및 2000.0g의 SMA 3000을 반응기에 채우고 90℃로 가열한다. 2000.0g fills the elegant play * SMA 3000 of PMA and 2000.0g of the reactor is heated to 90 ℃. 고체를 완전히 용해시키고 30분 후 용액을 주위 온도(~25℃)로 냉각시킨다. The solid completely dissolved and then cooled to ambient temperature (~ 25 ℃) solution after 30 minutes. 무수물 경화제 용액은 투명한 담황색을 띤다. Anhydride hardener solution was ttinda a transparent, straw-colored. 무수물 경화제 용액의 이론적인 무수물 당량은 393이다(고형분 기준). The theoretical anhydride equivalent weight of the anhydride hardener solution was 393 (based on solids). 실시예 1에서 기재된 것과 동일한 방법을 사용하여 무수물 경화제 용액을 제조한다. Using a similar manner to that described in Example 1 to prepare the anhydride curing agent solution. 무수물 경화제 조성물은 1821.3g의 사이클로헥사논, 1510.0g의 SMA 3000, 238.7g의 리콘 * 130MA13, 47.7g의 SBM 1A17 및 364.3g의 MEK를 함유한다. Anhydride hardener composition contains the 1821.3g of cyclohexanone, 1510.0g of SMA 3000, 238.7g of the silicone * 130MA13, 47.7g of SBM 1A17 and 364.3g of MEK. 생성된 무수물 경화제 용액은 탁하고 약간 흰색을 띠며 균질하다. The anhydride curing agent solution produced is suspended and homogenized ttimyeo some white. 경화제 용액은 2개월의 시험기간 동안 상 분리 및 침전을 일으키지 않고 안정하다. A curing agent solution is stable without causing phase separation and settling during a two-month test period. 경화제 용액의 이론적인 무수물 당량은 431이다(고형분 기준). A theoretical anhydride equivalent weight of the hardener solution was 431 (based on solids). 실시예 1에서 기재된 것과 동일한 방법을 사용하여 무수물 경화제 용액을 제조한다. Using a similar manner to that described in Example 1 to prepare the anhydride curing agent solution. 무수물 경화제 조성물은 1821.3g의 사이클로헥사논, 1490.6g의 SMA 3000, 254.9g의 리콘 * 131MA10, 51.0g의 SBM 1A17 및 364.3g의 MEK를 함유한다. Anhydride hardener composition contains the 1821.3g of cyclohexanone, 1490.6g of SMA 3000, 254.9g of the silicone * 131MA10, 51.0g of SBM 1A17 and 364.3g of MEK. 무수물 경화제 용액은 탁하고 약간 흰색을 띠며 균질하다. Anhydride curing agent solution is suspended and homogenized ttimyeo some white. 경화제 용액은 2개월의 시험기간 동안 상 분리 및 침전을 일으키지 않고 안정하다. A curing agent solution is stable without causing phase separation and settling during a two-month test period. 경화제 용액의 이론적인 무수물 당량은 444이다(고형분 기준). A theoretical anhydride equivalent weight of the hardener solution was 444 (based on solids). 실시예 1에서 기재된 것과 동일한 방법을 사용하여 무수물 경화제 용액을 제조한다. Using a similar manner to that described in Example 1 to prepare the anhydride curing agent solution. 무수물 경화제 조성물은 1216.3g의 다우아놀 * PMA, 1216.3g의 SMA 3000, 168.7g의 리콘 * 131MA10, 29.2g의 SBM 1A17 및 285.5g의 MEK를 함유한다. Anhydride hardener composition contains the elegant play * PMA, 1216.3g of SMA 3000, 168.7g of the silicone * 131MA10, MEK of SBM 1A17 and 285.5g of 29.2g of 1216.3g. 무수물 경화제 용액은 탁하고 약간 흰색을 띠며 균질하다. Anhydride curing agent solution is suspended and homogenized ttimyeo some white. 경화제 용액은 2개월의 시험기간 동안 상 분리 및 침전을 일으키지 않고 안정하다. A curing agent solution is stable without causing phase separation and settling during a two-month test period. 경화제 용액의 이론적인 무수물 당량은 433이다(고형분 기준). A theoretical anhydride equivalent weight of the hardener solution was 433 (based on solids). 실시예 1에서 기재된 것과 동일한 방법을 사용하여 무수물 경화제 용액을 제조한다. Using a similar manner to that described in Example 1 to prepare the anhydride curing agent solution. 무수물 경화제 조성물은 1122.2g의 다우아놀 * PMA, 1050.3g의 SMA 3000, 60.7g의 리콘 * 131MA10, 12.1g의 SBM 1A17 및 112.8g의 MEK를 함유한다. Anhydride hardener composition contains the elegant play * PMA, 1050.3g of SMA 3000, 60.7g of silicone * 131MA10, 12.1g of SBM 1A17 and 112.8g 1122.2g of MEK. 무수물 경화제 용액은 탁하고 약간 흰색을 띠며 균질하다. Anhydride curing agent solution is suspended and homogenized ttimyeo some white. 경화제 용액은 2개월의 시험기간 동안 상 분리 및 침전을 일으키지 않고 안정하다. A curing agent solution is stable without causing phase separation and settling during a two-month test period. 경화제 용액의 이론적인 무수물 당량은 414이다(고형분 기준). A theoretical anhydride equivalent weight of the hardener solution was 414 (based on solids). 실시예 1에서 기재된 것과 동일한 방법을 사용하여 무수물 경화제 용액을 제조한다. Using a similar manner to that described in Example 1 to prepare the anhydride curing agent solution. 무수물 경화제 조성물은 1818.2g의 다우아놀 * PMA, 1718.9g의 SMA 3000, 134.4g의 리콘 * 131MA10, 99.9g의 리콘 * 130MA13, 46.9g의 SBM 1A17 및 181.8g의 MEK를 함유한다. Anhydride hardener composition contains the elegant play * PMA, 1718.9g of SMA 3000, 134.4g of the silicone * 131MA10, 99.9g of silicone * 130MA13, 46.9g of SBM 1A17 and 181.8g 1818.2g of MEK. 무수물 경화제 용액은 탁하고 약간 흰색을 띠며 균질하다. Anhydride curing agent solution is suspended and homogenized ttimyeo some white. 경화제 용액은 2개월의 시험기간 동안 상 분리 및 침전을 일으키지 않고 안정하다. A curing agent solution is stable without causing phase separation and settling during a two-month test period. 경화제 용액의 이론적인 무수물 당량은 430이다(고형분 기준). A theoretical anhydride equivalent weight of the hardener solution was 430 (based on solids). 이 실시예에서는 에폭시 용액(더 다우 케미칼 캄파니로부터 상업적으로 구입가능한 XU-19081.00)을 비교 실시예 A 및 실시예 1에 기재된 무수물 경화제 용액으로 경화시킴으로써 프리프레그 및 적층물을 제조한다. In this embodiment, to prepare a prepreg and a laminate by curing the anhydride hardener solution described in an epoxy solution (The Dow Chemical commercially available from Needle Co. XU-19081.00) in Comparative Example A and Example 1. 그런 후, 생성된 프리프레그 및 적층물의 특성을 비교한다. Then, compare the resultant prepreg and laminate characteristics. 표 Ⅰ에 설명된 바와 같은 와니스 용액을 직조 유리(표준 E-유리) 위에 도포한 후, 강제식 공기 유동으로 174℃에서 운전되는 3m 길이의 수평 장치를 사용하여 와니스를 중간 향상 포인트(B-스테이지 처리 프리프레그)까지 건조 및 경화시켜서 프리프레그를 제조한다. Table was applied over the varnish solution woven glass (standard E- glass), as described in Ⅰ, intermediate improvement of varnish using the horizontal unit length of 3m operating at 174 ℃ with forced air flow point (B- stage treatment and dried and cured by a prepreg) to produce a prepreg. 프리프레그를 30㎝×30㎝의 시트로 절단한다. It is cut from a sheet of the prepreg 30㎝ × 30㎝. 이어서, 다음과 같이 적층물을 제조한다: 8장의 프리프레그 시트를 구리 호일 사이에 함께 쌓고 프레스 안에 위치시킨다. Then, to prepare a laminate, as follows: build the eight sheets of the prepreg sheet together between copper foil and place in the press. 프리프레그 시트를 190℃의 프레스 내에서 25,000lbs의 압력 하에 90분간 완전하게 경화시킨다. A prepreg sheet in a press under a pressure of 190 ℃ of 25,000lbs thereby completely cured for 90 minutes. 프리프레그 분말의 용융 점도에 따라서 압력을 조절하여 충분한 유동을 제공함으로써 두께 1.5±0.1㎜의 적층물을 수득한다. Therefore, the melt viscosity of the prepreg powder, to obtain a laminate having a thickness of 1.5 ± 0.1㎜ by providing a sufficient flow by adjusting the pressure. 임의로 구리 호일 층을 에칭하여 덮이지 않은 적층물을 수득한다. Optionally etching the copper foil layer to obtain a laminate which is not covered. 생성된 적층물의 수지 함량은 43±3%이다. Resin content of the resulting laminate is 43 ± 3%. 상기 표 Ⅰ의 결과는 본 발명의 무수물 경화제를 사용하면 표준 무수물 경화제를 사용한 경우에 비해 프리프레그 및 적층물 모두에 대하여 시스템의 특성들이 현저하게 개선된다는 사실을 보여준다. The results in Table Ⅰ shows the fact that the characteristics of the system are remarkably improved with respect to both the prepreg and a laminate as compared to the case when using a standard anhydride curing agent using the anhydride hardener of the present invention. 본 발명의 무수물 경화제는 분진이 훨씬 더 적어 취급이 더욱 용이한 프리프레그를 제공한다. Anhydride curing agent of the present invention provides a prepreg which dust is more easy to handle even more reduced. 본 발명의 경화제는 적층물의 강인성도 상당히 증가시키며, 충격시 탈적층화 에너지가 비교 실시예 A의 적층물에 비해 4배 더 높다. A curing agent of the present invention sikimyeo also significantly increased the laminate toughness, four times higher than the laminate of Example A, the impact energy during stratified taljeok comparison. 유전 상수, 특히 Dk는 실시예 1의 무수물 경화제 용액을 사용하는 경우가 더 낮다. Dielectric constants, especially Dk is the lower case using the anhydride hardener solution of Example 1. 적층물의 뛰어난 열적 특성도 본 발명의 경화제를 사용하는 경우에 유지된다. Superior thermal properties laminate is also maintained in the case of using the curing agent of the present invention. 이 실시예는 레우나(Leuna) M780 에폭시 용액을 비교 실시예 A에 설명된 무수물 경화제 용액으로 경화시켜서 제조한 프리프레그 및 적층물의 특성을 설명한다. This example illustrates the LES Una (Leuna) M780 epoxy solution of Comparative Example a prepreg and laminate prepared by the curing characteristics by the anhydride hardener solution described in Example A. 프레스를 32,000lbs의 압력으로 조작하는 것을 제외하고는, 실시예 7에 설명된 것과 동일한 방법을 사용하여 프리프레그 및 적층물을 제조한다. A press using the same method as that described in in Example 7 except that the operation at a pressure of 32,000lbs to prepare a prepreg and laminate. 상기 표 Ⅱ의 결과는 표준 무수물 경화제를 사용하면 분진이 많은 프리프레그 및 취약한 적층물이 얻어진다는 사실을 보여준다. Results of Table Ⅱ when using a standard anhydride hardener shows the fact that a lot of dust prepreg and weak laminate is obtained. 이 실시예는 DER * 560 에폭시 용액을 실시예 2에 설명된 무수물 경화제 용액으로 경화시켜서 제조한 프리프레그 및 적층물의 특성을 설명한다. This example illustrates a prepreg and laminate prepared by the curing characteristics by the anhydride hardener solution described the DER * 560 epoxy solution with the second embodiment. 프레스를 60,000lbs의 압력으로 조작하는 것을 제외하고는, 실시예 7에 설명된 것과 동일한 방법을 사용하여 프리프레그 및 적층물을 제조한다. A press using the same method as that described in in Example 7 except that the operation at a pressure of 60,000lbs to prepare a prepreg and laminate. 상기 표 Ⅲ의 결과는 본 발명의 무수물 경화제를 사용하면 표준 무수물 경화제를 사용한 경우에 비해 프리프레그 및 적층물 모두에 대하여 시스템의 특성들이 현저하게 개선된다는 사실을 보여준다. The results in Table Ⅲ shows the fact that the characteristics of the system are remarkably improved with respect to both the prepreg and a laminate as compared to the case when using a standard anhydride curing agent using the anhydride hardener of the present invention. 무수물 경화제는 비교 실시예 C에 비해서 절단 중에 발생하는 프리프레그 분진이 9배 더 적어 취급이 더욱 용이한 프리프레그를 제공한다. Anhydride curing agent provides a prepreg the prepreg dust is handled more easily fewer 9x generated during cutting compared to the Comparative Examples C. 또한 적층물의 강인성도 상당히 증가하며, 충격시 탈적층화 에너지가 비교 실시예 C의 적층물에 비해 2.5배 더 높다. In addition, and also significantly increased the laminate toughness, 2.5 times higher than the laminate of the exemplary shock taljeok stratified energy Comparative Examples C. 뛰어난 열적 특성 및 유전 상수가 유지된다. The excellent thermal properties and dielectric constants are maintained. 이 실시예는 DER * 560 에폭시 용액을 실시예 3에 설명된 무수물 경화제 용액으로 경화시켜서 제조한 프리프레그 및 적층물의 특성을 설명한다. This example illustrates a prepreg and laminate prepared by the curing characteristics by the anhydride hardener solution described the DER * 560 epoxy solution in Example 3. Fig. 프레스를 45,000lbs의 압력으로 조작하는 것을 제외하고는, 실시예 7에 설명된 것과 동일한 방법을 사용하여 프리프레그 및 적층물을 제조한다. A press using the same method as that described in in Example 7 except that the operation at a pressure of 45,000lbs to prepare a prepreg and laminate. 상기 표 Ⅳ의 결과는 본 발명의 무수물 경화제를 사용하면 표준 무수물 경화제를 사용한 경우에 비해 프리프레그 및 적층물 모두에 대하여 시스템의 특성들이 현저하게 개선된다는 사실을 보여준다. The results in Table Ⅳ shows the fact that the characteristics of the system are remarkably improved with respect to both the prepreg and a laminate as compared to the case when using a standard anhydride curing agent using the anhydride hardener of the present invention. 본 발명의 무수물 경화제는 분진이 훨씬 더 적어 취급이 더욱 용이한 프리프레그를 제공한다. Anhydride curing agent of the present invention provides a prepreg which dust is more easy to handle even more reduced. 또한 적층물의 강인성도 상당히 증가하며, 충격시 탈적층화 에너지가 비교 실시예 C의 적층물에 비해 3.1배 더 높다. In addition, and also significantly increased the laminate toughness, 3.1 times higher than the laminate of the exemplary shock taljeok stratified energy Comparative Examples C. 뛰어난 열적 특성 및 유전 상수가 유지된다. The excellent thermal properties and dielectric constants are maintained. 이 실시예는 레우나 M780 에폭시 용액을 실시예 4에 설명된 무수물 경화제 용액으로 경화시켜서 제조한 프리프레그 및 적층물의 특성을 설명한다. This embodiment will be described LES Una Example 4 A prepreg and a laminate prepared by the curing characteristics by the anhydride hardener solution described in M780 epoxy solution. 프레스를 30,000lbs의 압력으로 조작하는 것을 제외하고는, 실시예 7에 설명된 것과 동일한 방법을 사용하여 프리프레그 및 적층물을 제조한다. A press using the same method as that described in in Example 7 except that the operation at a pressure of 30,000lbs to prepare a prepreg and laminate. 상기 표 Ⅴ의 결과는 본 발명의 무수물 경화제를 사용하면 분진이 발생하지 않아 취급이 용이한 프리프레그가 얻어진다는 사실을 보여준다. The results in Table Ⅴ when using the anhydride hardener of the present invention shows that there is a prepreg easy to handle does not generate dust obtained. 또한 양호한 적층물 강인성도 얻어진다. Further it is also obtained a good laminate toughness. 열적 특성 및 유전 상수가 우수하다. The thermal properties and dielectric constant is excellent. 이 실시예는 레우나 M780 에폭시 용액을 실시예 5에 설명된 무수물 경화제 용액으로 경화시켜서 제조한 프리프레그 및 적층물의 특성을 설명한다. This embodiment will be described LES Una M780 epoxy solution Example 5 A prepreg and a laminate prepared by the curing characteristics by the anhydride hardener solution described. 상기 표의 결과는 본 발명의 무수물 경화제를 사용하면 양호한 적층물 강인성이 얻어진다는 사실을 보여준다. The table results have shown that when obtained a good laminate toughness using the anhydride hardener of the present invention. 또한 양호한 적층물 강인성도 얻어진다. Further it is also obtained a good laminate toughness. 열적 특성 및 유전 상수가 우수하다. The thermal properties and dielectric constant is excellent. 이 실시예는 DER * 560 및 DEN * 438 에폭시 용액의 배합물을 실시예 6에 설명된 무수물 경화제 용액으로 경화시켜서 제조한 프리프레그 및 적층물의 특성을 설명한다. This example illustrates the DER * 560 and DEN * 438 epoxy solution with the prepreg and laminate prepared by curing properties as the anhydride hardener solution described in Example 6. The formulation of. 프레스를 23,000lbs의 압력으로 조작하는 것을 제외하고는, 실시예 7에 설명된 것과 동일한 방법을 사용하여 프리프레그 및 적층물을 제조한다. A press using the same method as that described in in Example 7 except that the operation at a pressure of 23,000lbs to prepare a prepreg and laminate. 상기 표 Ⅶ의 결과는 본 발명의 무수물 경화제를 사용하면 양호한 적층물 강인성이 얻어진다는 사실을 보여준다. Results of Table Ⅶ have shown that when obtained a good laminate toughness using the anhydride hardener of the present invention. 열적 특성 및 유전 상수가 뛰어나다. The excellent thermal and dielectric constant. 실시예 1에 설명된 것과 동일한 방법을 사용하여 무수물 경화제 용액을 제조한다. Carried out using the same procedure described in Example 1 to prepare the anhydride curing agent solution. 무수물 경화제 조성물은 1750.0g의 다우아놀 * PMA, 1857.1g의 SMA 3000, 215.9g의 리콘 * 131MA10, 27.0g의 SBM 1A40 및 350.0g의 MEK를 함유한다. Anhydride hardener composition contains the elegant play * PMA, 1857.1g of SMA 3000, 215.9g of the silicone * 131MA10, MEK of SBM 1A40 and 350.0g of 27.0g of 1750.0g. 무수물 경화제 용액은 탁하고 약간 흰색을 띠며 균질하다. Anhydride curing agent solution is suspended and homogenized ttimyeo some white. 경화제 용액은 2개월의 시험기간 동안 상 분리 및 침전을 일으키지 않고 안정하다. A curing agent solution is stable without causing phase separation and settling during a two-month test period. 무수물 경화제 용액의 이론적인 무수물 당량은 424이다(고형분 기준). The theoretical anhydride equivalent weight of the anhydride hardener solution was 424 (based on solids). 실시예 1에 설명된 것과 동일한 방법을 사용하여 무수물 경화제 용액을 제조한다. Carried out using the same procedure described in Example 1 to prepare the anhydride curing agent solution. 무수물 경화제 조성물은 1800.0g의 다우아놀 * PMA, 1449.2g의 SMA 3000, 215.0g의 리콘 * 130MA13, 35.8g의 SBM 1A17 및 300.0g의 MEK를 함유한다. Anhydride hardener composition contains the elegant play * PMA, 1449.2g of SMA 3000, 215.0g of the silicone * 130MA13, MEK of SBM 1A17 and 300.0g of 35.8g of 1800.0g. 무수물 경화제 용액은 탁하고 약간 흰색을 띠며 균질하다. Anhydride curing agent solution is suspended and homogenized ttimyeo some white. 경화제 용액은 2개월의 시험 기간 동안 상 분리 및 침전을 일으키지 않고 안정하다. A curing agent solution is stable without causing phase separation and settling during a two-month test period. 무수물 경화제 용액의 이론적인 무수물 당량은 420이다(고형분 기준). The theoretical anhydride equivalent weight of the anhydride hardener solution was 420 (based on solids). 실시예 1에 설명된 것과 동일한 방법을 사용하여 무수물 경화제 용액을 제조한다. Carried out using the same procedure described in Example 1 to prepare the anhydride curing agent solution. 무수물 경화제 조성물은 3671.9g의 다우아놀 * PMA, 3623.2g의 SMA 3000, 730.7g의 리콘 130MA13, 146.1g의 SBM 1A17 및 828.1g의 MEK를 함유한다. Anhydride hardener composition contains the elegant play * PMA, 3623.2g of SMA 3000, 730.7g of silicon 130MA13, MEK of SBM 1A17 and 828.1g of 146.1g of 3671.9g. 무수물 경화제 용액은 탁하고 약간 흰색을 띠며 균질하다. Anhydride curing agent solution is suspended and homogenized ttimyeo some white. 경화제 용액은 2개월의 시험 기간 동안 상 분리 및 침전을 일으키지 않고 안정하다. A curing agent solution is stable without causing phase separation and settling during a two-month test period. 무수물 경화제 용액의 이론적인 무수물 당량은 439이다(고형분 기준). The theoretical anhydride equivalent weight of the anhydride hardener solution was 439 (based on solids). 이 예는 에폭시 용액(더 다우 케미칼 캄파니로부터 상업적으로 구입가능한 XU-19081.00)을 비교 실시예 A에서 설명한 무수물 경화제 및 5phr의 액상 고무 강인화제 CTBN 1300X13으로 경화시켜서 제조한 프리프레그 및 적층물의 특성들을 설명한다. This example of a prepreg and laminate characteristics produced epoxy solution to cure the (more commercially available XU-19081.00 from Dow Chemical Company) with anhydride curing agent and liquid rubber tenacity agent CTBN 1300X13 of 5phr described in Comparative Example A It will be described. 표 Ⅷ에 설명된 바와 같은 와니스 용액을 직조 유리(표준 E-유리) 위에 핸드 레이업(hand lay-up) 기술로 코팅한 후, 코팅된 직조 유리를 강제 공기 유동으로 175℃에서 운전되는 통기식 오븐을 사용하여 중간 향상 포인트(B-스테이지 처리 프리프레그)까지 건조 및 경화시켜서 프리프레그를 제조한다. A varnish solution as described in Table Ⅷ woven glass (standard E- glass) airflow operating at above was coated by hand lay-up (hand lay-up) technology, 175 ℃ the coated woven glass to force the air flow using the improved oven middle point (B- staging the prepreg) thereby to drying and curing to produce a prepreg. 실시예 7에 설명된 바와 같이 프리프레그를 30㎝×30㎝의 시트로 절단한 후 구리 호일을 프리프레그 사이에 압축시켜서 적층물을 제조한다. Example 7 by compressing the copper foil was cut into sheets of the prepreg 30㎝ × 30㎝ as described in between the prepreg to prepare a laminate. 비교 실시예 D를 실시예 7 및 비교 실시예 B와 비교할 수 있다. Comparative Example can be compared to examples D and Example 7 and Comparative Example B. 필름 외관 (a) Film appearance (a) 유백광, 덜 취약함, 비교 실시예 B보다 기포가 덜 발생함. U white point, also less vulnerable, Comparative Example B hereinafter bubbles are less likely to occur than. 상기 표 Ⅷ의 결과는 액상의 고무 강인화제는 비교 실시예 B의 와니스 1을 사용하여 제조한 대조용 시스템에 비해서 일부 특성(강인화도, 구리 박리 강인성)을 개선시키고, 또한 일부 다른 특성(Tg, 40℃에서의 프리프레그 안정성)에도 현저한 영향을 미친다는 사실을 보여준다. Results of Table Ⅷ some properties compared to the to-be-verified system produced using the rubber tenacity agent of liquid phase is Comparative Example B Varnish 1 (strong affinity, copper peel toughness) were improved, and some other properties (Tg, prepreg stability at 40 ℃) shows that even have a significant effect. 와니스 2(실시예 7)에 설명된 바와 같은 개선된 무수물 경화제를 사용하면 모든 성능이 훨씬 더 좋아지게 된다. If used, the anhydride curing agent improved as described in Varnish 2 (Example 7) becomes all the performance is much better. 이 실시예는 DEN * 431 에폭시 용액을 TBBA 및 실시예 13에 설명된 무수물 용액으로 경화시켜서 제조한 프리프레그 및 적층물의 특성을 설명한다. This example illustrates a prepreg and laminate characteristics prepared by curing a DEN * 431 epoxy solution with the anhydride solution described in Example 13, and TBBA. 프리프레그 및 적층물은 실시예 7에 설명된 것과 동일한 방법을 사용하여 제조한다. Prepreg and laminates are prepared using the same method as described in Example 7. 상기 표 Ⅸ의 결과는 DEN * 431 에폭시 용액 및 TBBA의 배합물과 함께 본 발명의 무수물 경화제를 사용하면 구리에 대해 비교적 양호한 접착성을 갖는 우수한 프리프레그가 얻어진다는 사실을 보여준다. Results of Table Ⅸ have shown that using the anhydride hardener of the present invention with a DEN * 431 epoxy solution and the formulation of the TBBA excellent prepreg with relatively good adhesion to copper is achieved. 이 실시예는 DER * 560 및 DEN * 438 에폭시 용액의 배합물을 실시예 14에 설명된 무수물 경화제 용액으로 경화시켜서 제조한 프리프레그 및 적층물의 특성을 설명한다. This example illustrates the DER * 560 and DEN * 438 epoxy solution with the prepreg and laminate prepared by curing properties as the anhydride hardener solution described in the Example 14 formulation in. 상기 표 Ⅹ의 결과는 본 발명의 무수물 경화제를 사용하면 뛰어난 전반적 특성들을 갖는 적층물이 얻어진다는 사실을 보여준다. Results of Table Ⅹ have shown that when the obtained laminate having excellent overall properties using the anhydride hardener of the present invention. 이 실시예는 DER * 560 및 ERL-4299 에폭시 용액의 배합물을 실시예 14에 설명된 무수물 경화제 용액으로 경화시켜서 제조한 프리프레그 및 적층물의 특성을 설명한다. This example illustrates a prepreg and laminate prepared by the curing characteristics by the anhydride hardener solution described in Example 14, the DER * 560 and ERL-4299 epoxy solution formulation. 상기 표 XⅠ의 결과는 본 발명의 무수물 경화제를 사용하면 뛰어난 열적 특성과 전기적 특성을 갖는 적층물이 얻어진다는 사실을 보여준다. Results of Table XⅠ have shown that when obtained a laminate having excellent thermal and electrical properties using the anhydride hardener of the present invention. 이 실시예는 DER * 560 및 DEN * 438 에폭시 용액의 배합물을 실시예 15에 설명된 무수물 경화제 용액으로 경화시켜서 제조한 프리프레그 및 적층물의 특성을 설명한다. This example illustrates the DER * 560 and DEN * 438 epoxy solution with the prepreg and laminate prepared by curing properties as the anhydride hardener solution described in the Example 15 formulation in. 상기 표 XⅡ의 결과는 본 발명의 무수물 경화제를 사용하면 양호한 열적 특성과 수지 코팅 구리 호일에서의 뛰어난 접착성을 갖는 적층물이 얻어진다는 사실을 보여준다. Results of Table XⅡ have shown that when using the obtained laminate having excellent adhesiveness in good thermal properties and resin coated copper foil, the anhydride hardener of the present invention. 에틸렌계 불포화 무수물과 비닐 화합물과의 공중합체인 카복실산 무수물(a)과 에틸렌계 불포화 무수물과 탄성중합체와의 공중합체(b)와의 배합물을 포함하는, 폴리에폭사이드 수지를 경화시키는 데 유용한 경화제 조성물. The ethylene copolymer of the unsaturated anhydride and a vinyl compound chain carboxylic acid anhydride (a) and an ethylenically unsaturated anhydride and an elastomer and a copolymer (b) useful for the curing agent composition used to cure the polyepoxide resin to the poly containing formulation with a. 하나 이상의 가교결합제(II)를 포함하고, 상기 하나 이상의 가교결합제(II)가 에틸렌계 불포화 무수물과 비닐 화합물과의 공중합체인 카복실산 무수물(a)과 에틸렌계 불포화 무수물과 탄성중합체와의 공중합체(b)와의 배합물을 포함하는, 경화성 에폭시 수지 조성물. Comprising at least one cross-linking agent (II), and wherein the one or more cross-linking agents (II) are copolymers of an ethylenically unsaturated anhydride and a copolymer of acid anhydride (a) and an ethylenically unsaturated anhydride and an elastomer with the vinyl compound (b ) comprising a blend with the curable epoxy resin composition. 제1항 또는 제2항에 있어서, 상기 에틸렌계 불포화 무수물과 비닐 화합물과의 공중합체가 스티렌과 말레산 무수물과의 공중합체(SMA)인, 조성물. According to claim 1 or 2, wherein the ethylene-based copolymer of the unsaturated anhydride and a vinyl compound and styrene-maleic acid copolymer (SMA) with the anhydride, the composition. 제1항 또는 제2항에 있어서, 상기 에틸렌계 불포화 무수물과 탄성중합체와의 공중합체가 말레산 무수물-개질된 폴리부타디엔(PBMA)인, 조성물. According to claim 1 or 2, wherein the ethylenically unsaturated anhydride and an elastomeric polymer and a copolymer of maleic anhydride-modified polybutadiene (PBMA) of the composition. 제1항 또는 제2항에 있어서, 성분(a)와 성분(b)의 상 분리를 막기 위하여 스티렌-부타디엔-메틸 메타크릴레이트(SBM)의 트리블록 공중합체인 안정제(c)를 함유하는, 조성물. According to claim 1 or 2 wherein component (a) and component (b) styrene to prevent phase separation of the-triblock containing copolymer stabilizer (c), the composition of methyl methacrylate (SBM) - butadiene . 제1항 또는 제2항에 있어서, 용매(d)를 함유하는, 조성물. According to claim 1 or 2, wherein the composition containing the solvent (d). 제1항 또는 제2항에 있어서, 붕산, 붕소를 함유하는 루이스산, 약한 친핵성 음이온을 갖는 산, 및 pKa 1 내지 3의 유기산으로 이루어진 그룹으로부터 선택된 한 종 이상의 경화 억제제(e)를 함유하는, 조성물. According to claim 1 or 2, boric acid, a Lewis acid containing a boron containing a weak nucleophilic acid having an anion, and pKa 1 to han or more curing agents (e) selected from the group consisting of an organic acid of 3 composition. 제1항 또는 제2항에 있어서, 승온에서 폴리에폭사이드와 반응할 수 있는 이관능성 쇄 연장제 화합물(f)을 추가로 함유하는 조성물. According to claim 1 or 2, wherein the composition containing at elevated temperature an additional bifunctional chain extender compound (f) capable of reacting with the polyepoxide. 제1항 또는 제2항에 있어서, 카복실산 및 산 무수물로 이루어진 그룹으로부터 선택된 한 종 이상의 보조-가교결합제(g)를 추가로 함유하는, 조성물. According to claim 1 or 2, wherein the carboxylic acid and one or more auxiliary element selected from the group consisting of acid anhydride containing an additional crosslinking agent (g), the composition. 제12항에 있어서, 상기 보조-가교결합제가, 관능화도가 2.2 이상인 하이드록시-관능성 보조-가교결합제인, 조성물. The method of claim 12, wherein the co-crosslinking agent, a functional degree of 2.2 or more hydroxy-functional co-crosslinking agent, the composition. 제2항에 있어서, 상기 조성물 중에 존재하는 에틸렌계 불포화 무수물과 비닐 화합물과의 공중합체인 카복실산 무수물이, 에폭시 대 무수물의 몰 비가 0.8:1.0 내지 1.2:1.0으로 되도록 하는 양으로 존재하는, 조성물. The method of claim 2, wherein the copolymer of carboxylic acid anhydride with an ethylenically unsaturated anhydride and a vinyl compound present in the composition, the molar ratio of 0.8 for epoxy anhydride: 1.0 to 1.2: 1.0, which is present in an amount such that the composition. 제1항 또는 제2항에 있어서, 상기 조성물 중에 존재하는 성분(b)가, 성분(a) 대 성분(b)의 중량비가 95:5 내지 80:20으로 되도록 하는 양으로 존재하는, 조성물. The components present in the method, the composition in one or more of the preceding claims (b) an ingredient (a) the weight ratio of component (b) 95: which is present in an amount of 5 to 80: 20 so as to be the composition. 제5항에 있어서, 상기 조성물 중에 존재하는 안정제가, 성분(b) 대 성분(c)의 중량비가 60:40 내지 95:5로 되도록 하는 양으로 존재하는, 조성물. The method of claim 5, wherein the stabilizer present in the composition, component (b) weight ratio of component (c) 60:40 to 95: which is present in an amount such that at 5, the composition. 제11항에 있어서, 상기 이관능성 쇄 연장제 화합물이 비스페놀 A 및 테트라브로모비스페놀 A로부터 선택되는, 조성물. The method of claim 11 wherein the composition is a compound wherein the difunctional chain extender is selected from bisphenol A and tetrabromobisphenol A. 제2항에 있어서, 상기 폴리에폭사이드와 상기 가교결합제와의 반응을 촉진시키기 위한 촉매를 함유하는, 경화성 에폭시 수지 조성물. 3. The method of claim 2, which contains a catalyst for promoting the reaction with the crosslinking agent and the polyepoxide to the polyester, the curable epoxy resin composition. 제18항에 있어서, 상기 촉매가 헤테로사이클릭 질소 화합물, 아민, 포스핀, 암모늄 화합물, 포스포늄 화합물, 아르소늄 화합물 또는 설포늄 화합물인, 경화성 에폭시 수지 조성물. 19. The method of claim 18, wherein the catalyst is a heterocyclic nitrogen compound, an amine, a phosphine, an ammonium compound, a phosphonium compound, are sonyum compound or sulfonium compound, a curable epoxy resin composition. 제18항에 있어서, 상기 촉매가 이미다졸 및 벤즈이미다졸로부터 선택되는, 경화성 에폭시 수지 조성물. 19. The method of claim 18, wherein the catalyst is an imidazole and benz already selected from imidazole, the curable epoxy resin composition. 제2항에 있어서, 상기 폴리에폭사이드가 브롬화된 것인, 경화성 에폭시 수지 조성물. The method of claim 2, wherein in that the poly A polyepoxide is brominated, the curable epoxy resin composition. 제21항에 있어서, 상기 폴리에폭사이드가 테트라브로모비스페놀 A 디글리시딜 에테르인, 경화성 에폭시 수지 조성물. 22. The method of claim 21 wherein the polyester polyepoxide is tetrabromobisphenol A diglycidyl ether in the curable epoxy resin composition. 에틸렌계 불포화 무수물과 비닐 화합물과의 공중합체인 카복실산 무수물(a)을 에틸렌계 불포화 무수물과 탄성중합체와의 공중합체(b)와 혼합하는 단계를 포함하는, 경화제 조성물의 제조방법. The method of the ethylene comprising the step of blending the copolymer (b) of the copolymer and the acid anhydride (a) with an unsaturated anhydride and a vinyl compound an ethylenically unsaturated anhydride and an elastomer, a curing agent composition. 하나 이상의 폴리에폭사이드(I)를 하나 이상의 가교결합제(II)와 혼합하는 단계를 포함하고, 상기 하나 이상의 가교결합제(II)가 에틸렌계 불포화 무수물과 비닐 화합물과의 공중합체인 카복실산 무수물(a)과 에틸렌계 불포화 무수물과 탄성중합체와의 공중합체(b)와의 배합물을 포함하는, 경화성 에폭시 수지 조성물의 제조방법. One or more of the one or more poly-epoxide (I) cross-linking agent (II) and comprising the step of mixing, and wherein the at least one crosslinking agent (II) is copolymerized with the ethylenically unsaturated anhydride and a vinyl compound chain carboxylic acid anhydride (a) and ethylenically unsaturated anhydride and a method for producing an elastomeric copolymer (b) with a formulation comprising the curable epoxy resin composition. 제2항에 기재된 에폭시 수지 조성물을 함유하는 매트릭스를 포함하는 섬유 보강된 복합재 제품. The fiber reinforced composite article comprising a matrix comprising an epoxy resin composition described in (2). 제25항에 있어서, 전기 회로용 적층물 또는 프리프레그(prepreg)인 섬유 보강된 복합재 제품. 26. The method of claim 25, wherein the fiber reinforced composite products electric circuit laminate or prepreg (prepreg) for. 제26항에 있어서, 유전 상수가 4.3 이하인, 섬유 보강된 복합재 제품. The method of claim 26, wherein a dielectric constant of 4.3 or less, a fiber reinforced composite product. 제26항에 있어서, 유전정접(dielectric dissipation factor)이 0.020 미만인, 섬유 보강된 복합재 제품. The method of claim 26, wherein the dielectric loss tangent (dielectric dissipation factor) is lower than 0.020, a fiber reinforced composite product. 제2항에 기재된 에폭시 수지 조성물의 절연 코팅물을 갖는 전기 회로 부품. The electric circuit component having an insulating coating of the epoxy resin composition described in (2). 제2항에 기재된 에폭시 수지로 제품을 코팅하고, 상기 코팅된 제품을 가열하여 에폭시 수지를 경화시키는 단계를 포함하는, 코팅된 제품의 제조방법. The coated product of the epoxy resin as set forth in 2, and the method of producing a coated article comprising a step of curing the epoxy resin by heating the coated product. 경화제 조성물(c)을 포함하고, 상기 경화제 조성물(c)이 에틸렌계 불포화 무수물과 비닐 화합물과의 공중합체인 카복실산 무수물(i)과 에틸렌계 불포화 무수물과 탄성중합체와의 공중합체(ii)와의 배합물을 함유하는, 프리프레그. The curing agent composition (c), comprises the curing agent composition (c) is an ethylenically unsaturated anhydride and a copolymer of the vinyl compound-carboxylic acid anhydride (i) with an ethylenically unsaturated anhydride and a combination with the copolymer (ii) of the elastomeric , a prepreg containing. 상기 기재의 한 면 또는 양 면에 배치된 금속 층(b)을 포함하는 적층물. Laminate comprising a metal layer (b) disposed on one surface or both surfaces of the substrate. 제32항에 있어서, 상기 기재가 유리 직물의 보강재를 추가로 포함하고, 상기 에폭시 수지 및 경화제가 유리 직물에 함침되어 있는, 적층물. 33. The method of claim 32, wherein the base material further comprises a reinforcing material of glass cloth and the epoxy resin and curing agent, a laminate, which is impregnated into the glass cloth. 제32항에 기재된 적층물로 만들어진 인쇄 회로 기판(PWB). Print made from the laminate according to claim 32, wherein the circuit board (PWB). MX2011006681A (en) * 2008-12-22 2011-07-12 Saint Gobain Performance Plast Modified perfluoropolymer sheet material and methods for making same. MX2011010442A (en) * 2009-04-06 2012-01-19 Cray Valley Technology Usa Llc Caustic removable hot melt adhesive formulations.